I wake up every morning thinking about what I’m going to do for exercise that day. Some days, it’s easy — my calendar tells me it’s a running day so I run! Other days, I know I’ll be walking downtown in the evening for dinner or a special event. On those mornings when I have no special plans with respect to exercise, I have to get creative about what I’m going to do. The other day the big item on my calendar was my twice-monthly trip to Costco. Okay, so driving to Sequim was a given — but what could I do while I was over that way? Somehow the Dungeness National Wildlife Refuge popped into my head. 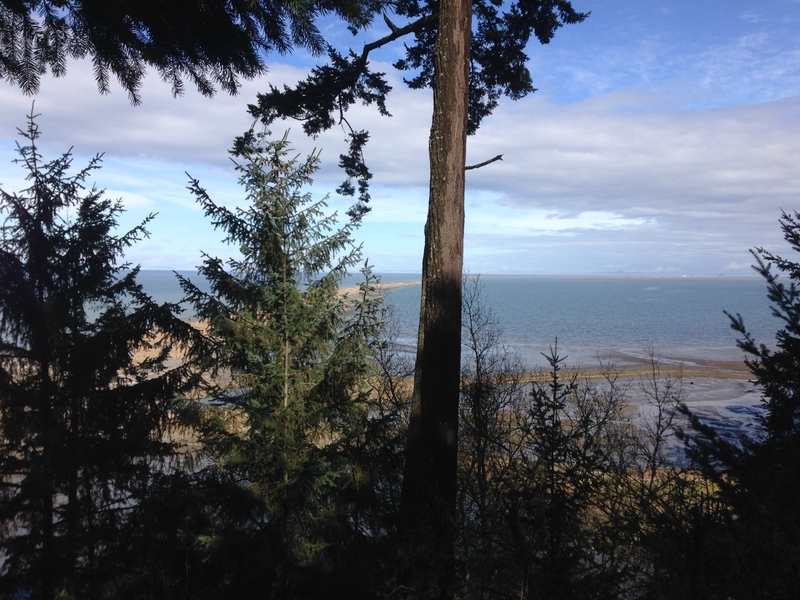 Dungeness NWR is comprised of the entire length of Dungeness Spit along with a section of forested bluff top. 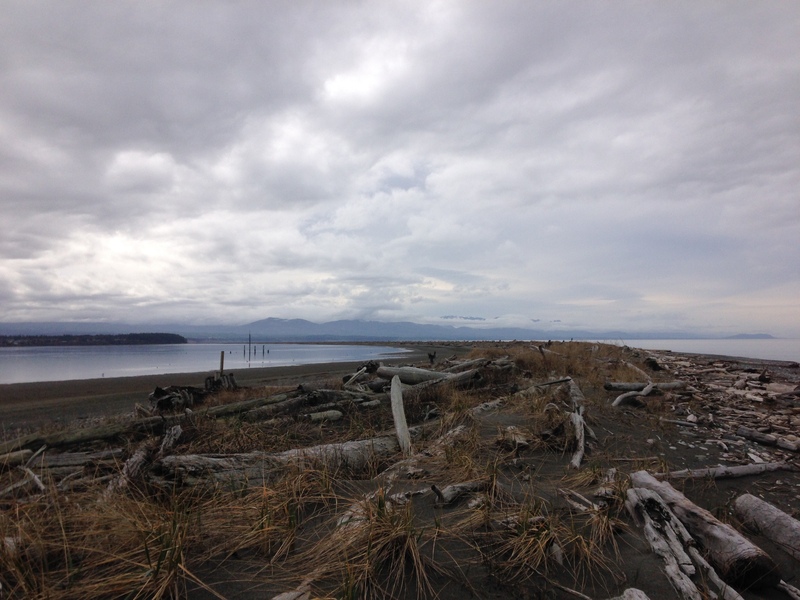 Dungeness Spit, one of the world’s longest natural sand spits, extends into the Strait of Juan de Fuca and is more than 5.5 miles long. I had visited Dungeness NWR only once before, in the summer of 2001, the year before I moved here. Why I never returned, I have no idea, but when I mentioned it to CFL, he was immediately enthusiastic. He hadn’t been there in years either! 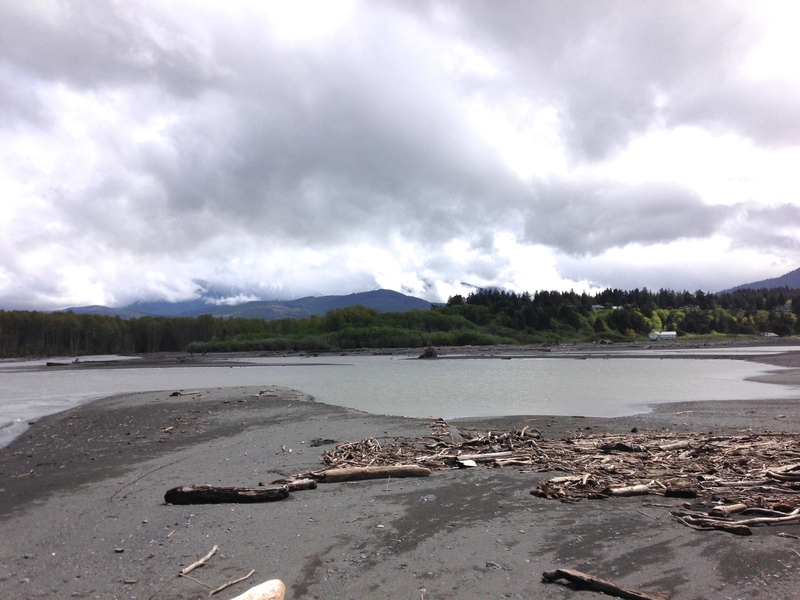 Our timing was good — it was low tide and it looked like we’d have a few hours’ break from the rain. We parked the car at the first possible parking area so that we could walk the bluff top trail before hiking down to the spit itself. The first view of the strait from the bluff top 140 feet above is stunning. 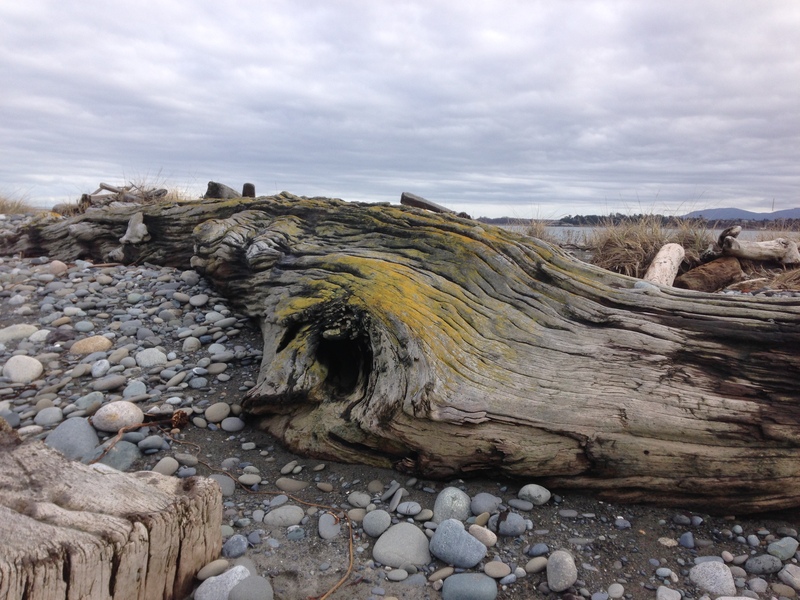 As you walk down the trail from the bluff top, more of the spit reveals itself. 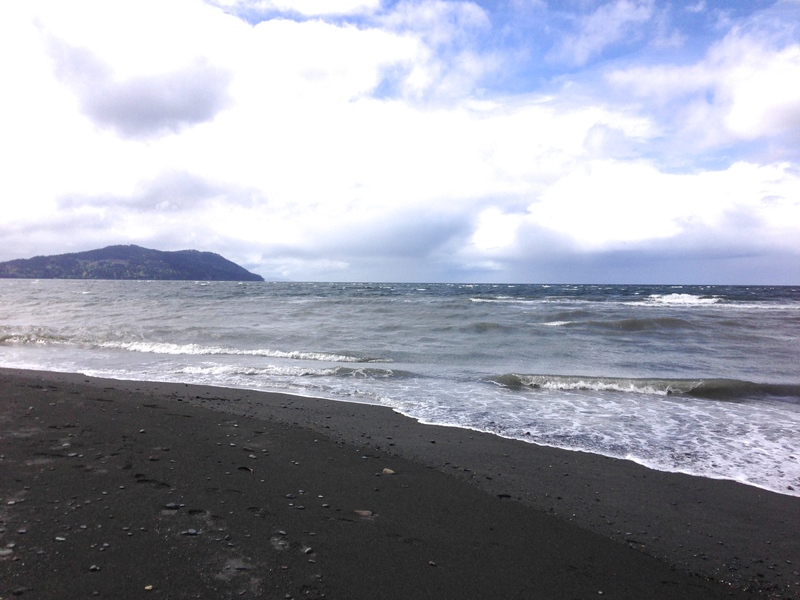 Once you are down on the sand, it’s a long flat walk along a beautiful beach. 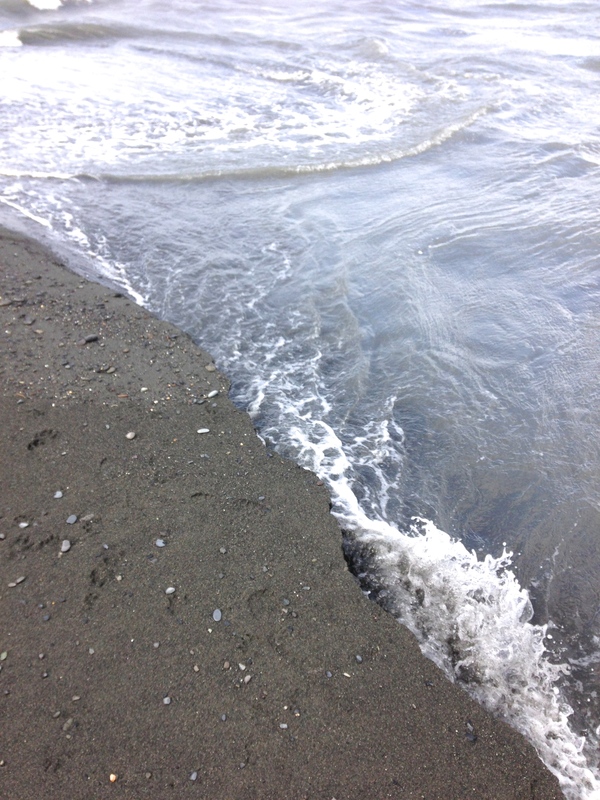 The outer (strait-facing) side of the spit is the hiking side, while the inner (mainland-facing) side is off-limits to humans. This is where hundreds of water birds amass at various times of the year, whether as a migration stopover or as a home for some species who nest here. 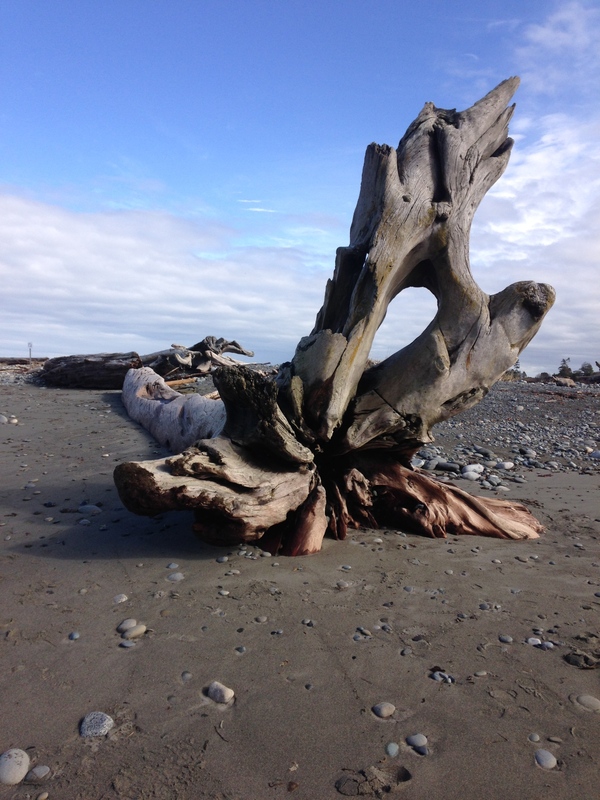 To see the birds, we needed to scramble onto the large driftwood logs that collect at the “summit” of the spit. 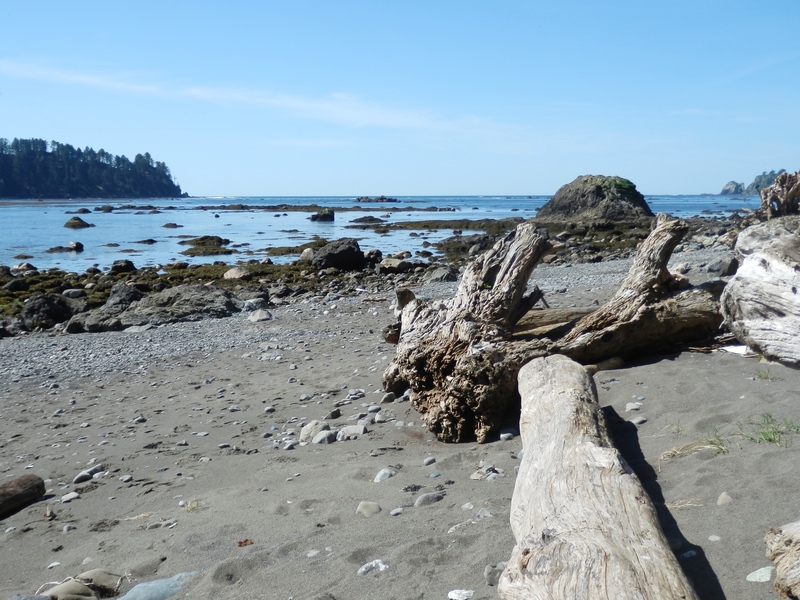 The logs themselves are so beautiful that we didn’t want to walk all over them, so we didn’t see that many birds. I’d forgotten to bring binoculars so we couldn’t do any serious birding anyway. But we certainly enjoyed the logs! As we continued our hike along the beach, the Dungeness Lighthouse came into view. Can you see it there in the distance? We turned around about two miles short of the lighthouse, as the afternoon was getting later and the sky was looking darker. 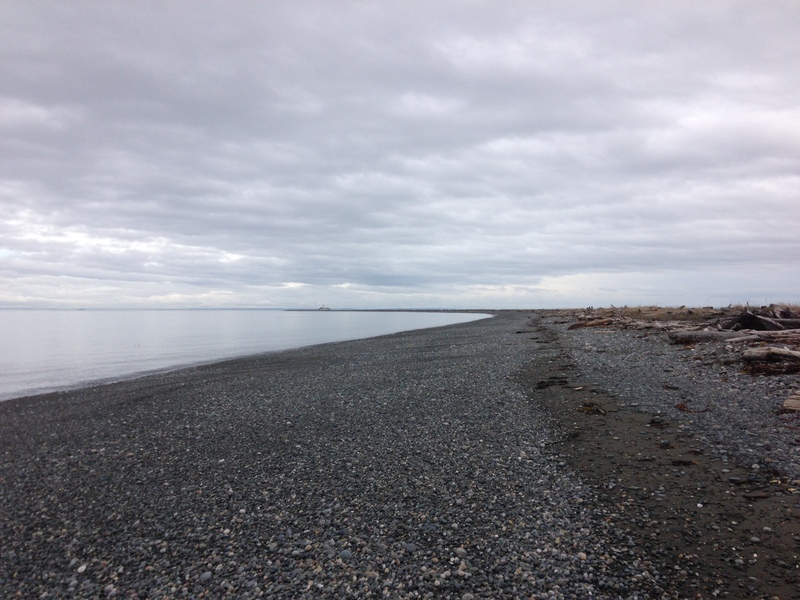 Here you can see both sides of the spit, looking back toward the bluff. On our way back I noticed an odd object on the sand. A jawbone! 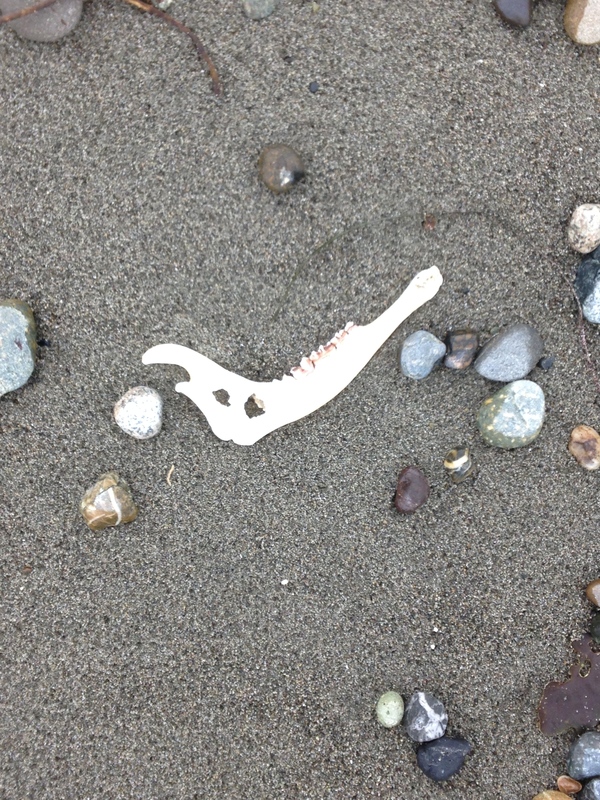 We think this was a juvenile seal, based on the fact that the rear molars appeared to be only partially erupted. It was probably 6-7 inches long. By the time we got back to the car, we’d hiked ten miles. When we return — and we will — we’ll give ourselves enough time to get all the way out past the lighthouse. And I’ll remember to bring my binoculars so I can identify some of the birds! To our great disappointment, we were unable to take part in the Chilly Hilly bike ride around Bainbridge Island yesterday. 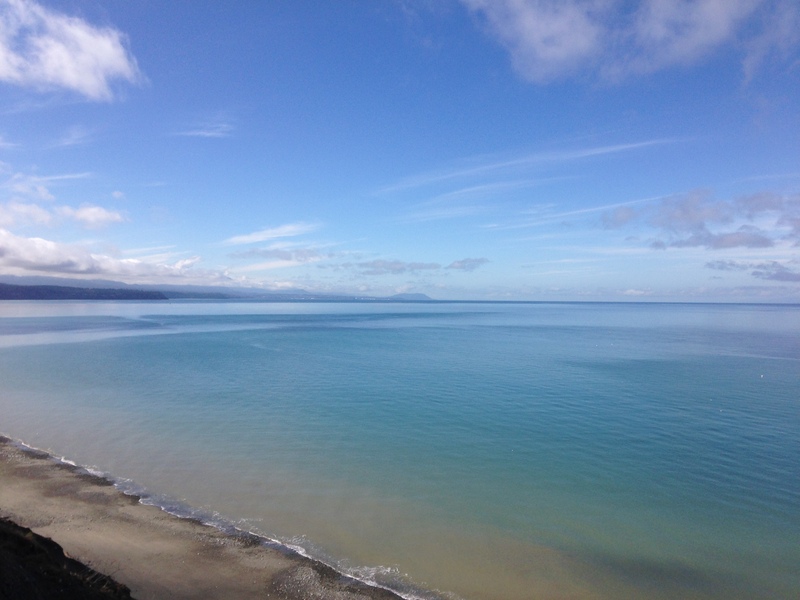 While the ride went off as scheduled for people who live nearby or in the Seattle area, the weather proved too daunting for us to venture forth from Port Angeles to get there. We’re about 75 miles (an hour and 40 minutes driving time) northwest of Bainbridge. The weather forecast over that way yesterday was for temperatures in the mid 40s with occasional rain showers. It wouldn’t have been a fun bike ride, but it was probably doable. When the alarm went off at 5:00 AM, it was snowing hard and our local forecast called for continuing snow — up to five inches of it — all day. Our part of the world was in the midst of its own little private winter! The snow wasn’t sticking at that early hour, but the thought of driving 75 miles on two-lane roads, then dealing with whatever the weather might turn out to be on Bainbridge — and then driving another 75 miles home! — was enough to cause me to turn off the alarm and go back to sleep. The snow here did continue on and off all day. Everything gradually turned white. At most we had maybe 1/4″ on the ground. The real epicenter of the storm was northeast of us in Bellingham, where they got about a foot of snow. I moped around the house for most of the day, then decided I might as well bundle up and go for a walk. At first CFL and I thought we’d walk down to the waterfront. We’d heard there were a hundred or more harbor seals there the other day, including several brand-new fuzzy babies! But we knew that if we walked downhill, the snow would probably turn to slushy rain at sea level. So we opted to walk uphill and enjoy the sight of snow falling through trees. 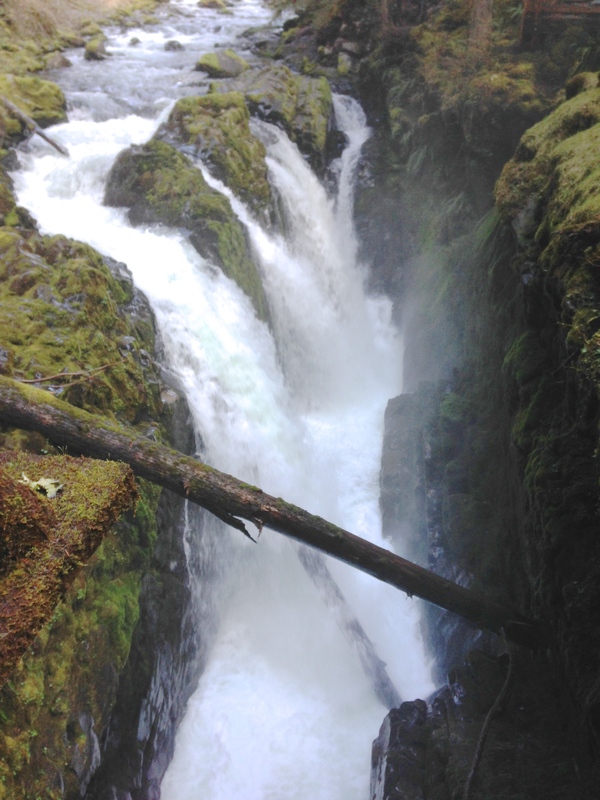 At some point I got the wacky idea of hiking the Peabody Creek trail. 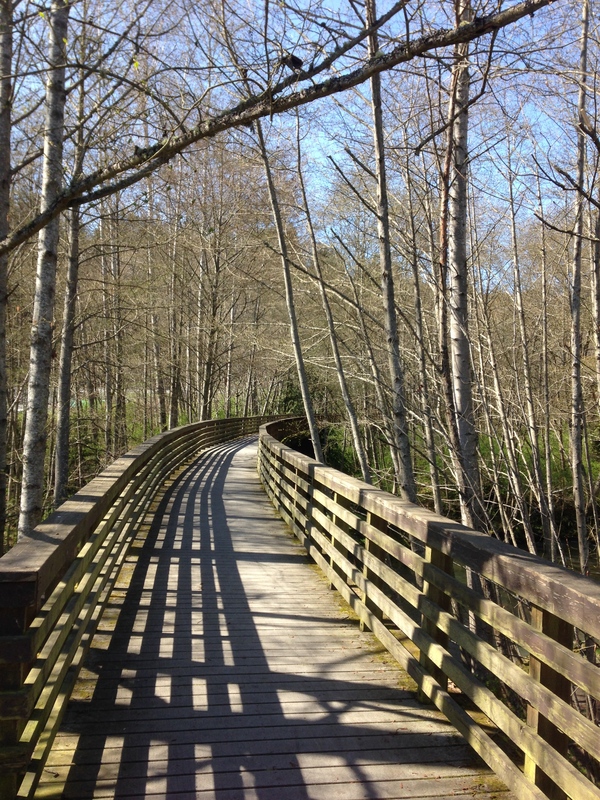 This is a low-country trail that begins just at the south end of town and winds about 3.5 miles upward along the creek to an elevation of about 1,100 feet. The trail itself was muddy but clear of snow. Alongside the trail, the snow was sticking and creating beautiful designs in the fallen leaves and moss. Looking upwards, the dance of snowflakes among the big trees was simply magical. I wish I could show you photos, but the snow falling on my iPhone caused the touch screen to shut down. I frantically stabbed at the virtual camera button several times before admitting defeat and putting the phone back in my pocket! As we gained altitude, the trail itself began to turn white. 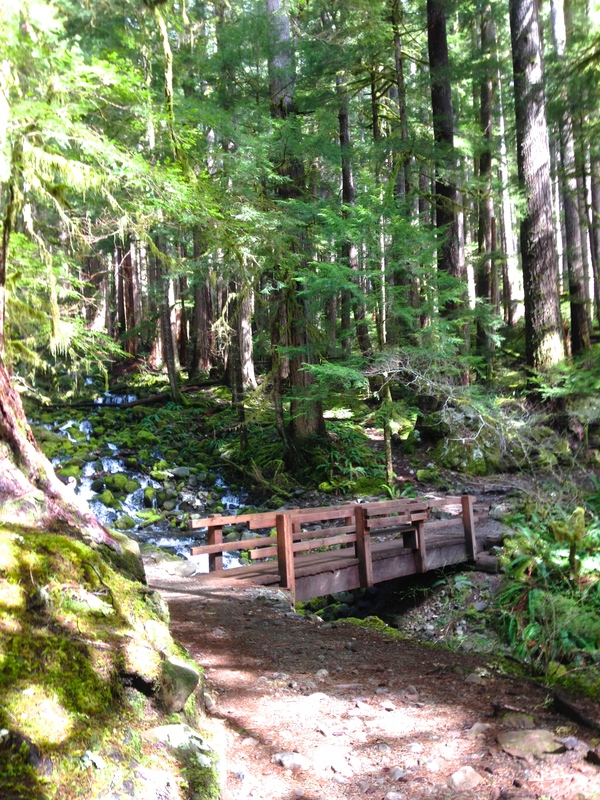 There are several creek crossings over log bridges, and those bridges were becoming quite slippery. I didn’t want to risk hiking back down the way we’d come (it always seems more slippery going downhill), so we decided to take the first opportunity to exit the trail early and return by way of the nearby road. Walking back down the road, we both realized that we’d forgotten to eat lunch and were starving. So we kept walking, all the way back down into town to our favorite pizza place. While we were there, the snow turned to rain, making for a less pleasant final leg of our walk. We ended up walking almost nine miles and saw some beautiful, peaceful sights that helped me forget the disappointment of missing an event that I’d looked forward to for a long time. Lesson learned! Next year, I won’t register for the Chilly Hilly ahead of time — I’ll wait for the weather forecast. Meanwhile, the activity streak remains intact. It’s still raining, with more snow in the forecast for later this afternoon. I haven’t decided yet what I’ll do today. Bundle up and go out for a run, or just a walk? Or hit the treadmill? So many ways to be slow and happy! In keeping with this blog’s theme of slow HAPPY living, I usually try to keep things here light and upbeat. Sometimes, however, a bit of philosophy is in order. After all, I AM a bit of a philosopher… but I’ll try to restrain myself and not do any really deep navel gazing in this post. Today I went for a hike. Usually CFL and I hike together, but he’s busy working on a big project. If you wonder whether the economy is ever going to improve, you may take heart from the fact that architects are suddenly getting work again. That’s great for CFL, but it has put a crimp on our summer hiking plans. So today was a perfect, clear and warm late summer day. We’ll only have a few more of these days before the rainy season returns. I sat around the house for a while, but when I found myself watching cat videos I knew I needed to get out of my chair, get outside, and move my feet. We’re 255 days into 2013, which means we’re 255 days (and I’m 1,520 miles) into our activity streak. On a busy day like today CFL still manages at least a two mile walk around the neighborhood. But I like to do a little more than that. So today I went for a hike. 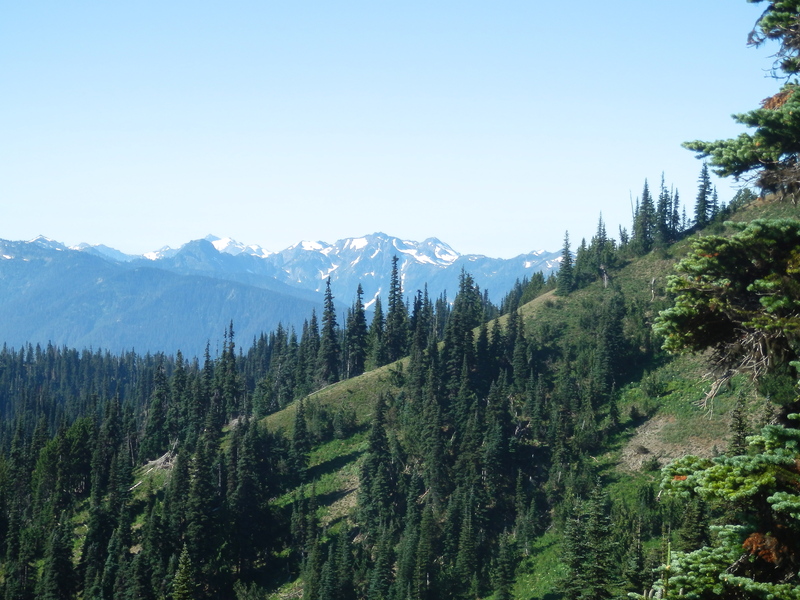 I went up to Hurricane Ridge and hiked the same trail that I did back on August 4. It’s an up-and-down trail that meanders along the side and top of a minor ridge, ultimately connecting with trails that climb steeply up the north side of the mountain. 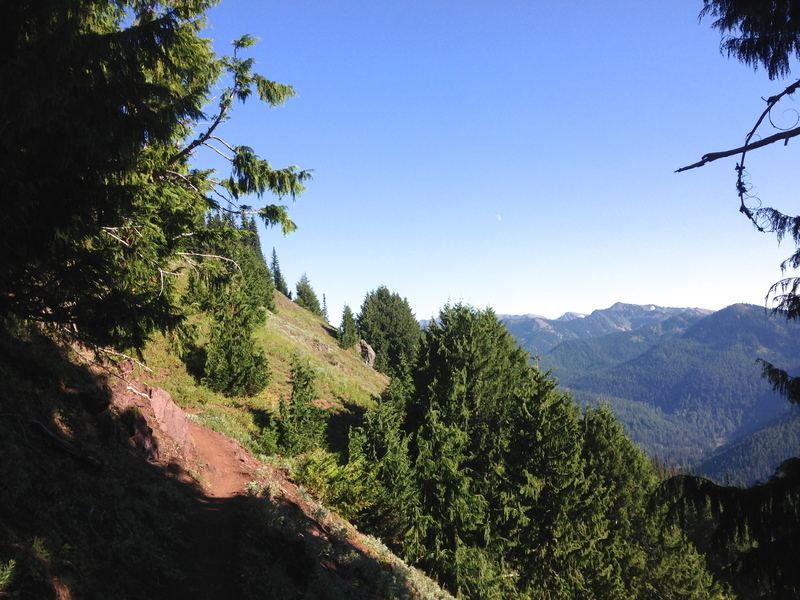 The elevation of this section of trail ranges from about 5,100 to 5,600 feet. Nothing really strenuous, just a lot of ups and downs, and on a warm day like today it’s a good workout. It’s a front country trail, so I felt comfortable hiking alone knowing there would be others in the area and that I would never be more than three miles from the car. As it turned out, I saw about ten other hikers — busier than some days but not so busy that I couldn’t do a whole lot of thinking and simply taking in the views and the moments of silence. Views like this kept me happy. I turned around at the first major fork in the trail. 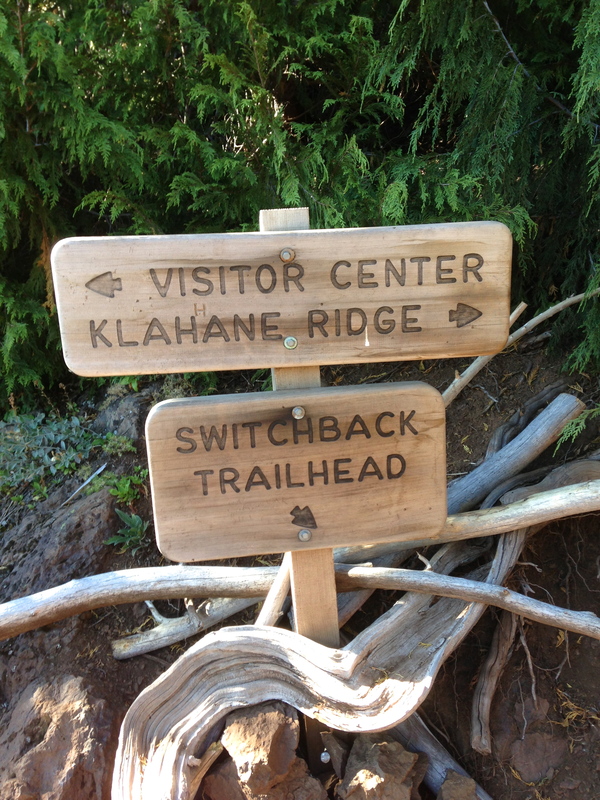 The Klahhane Ridge Trail (the trail I was on — and yes it is misspelled on the sign — if you look closely you can see that someone has corrected it!) begins to climb steeply at this point. 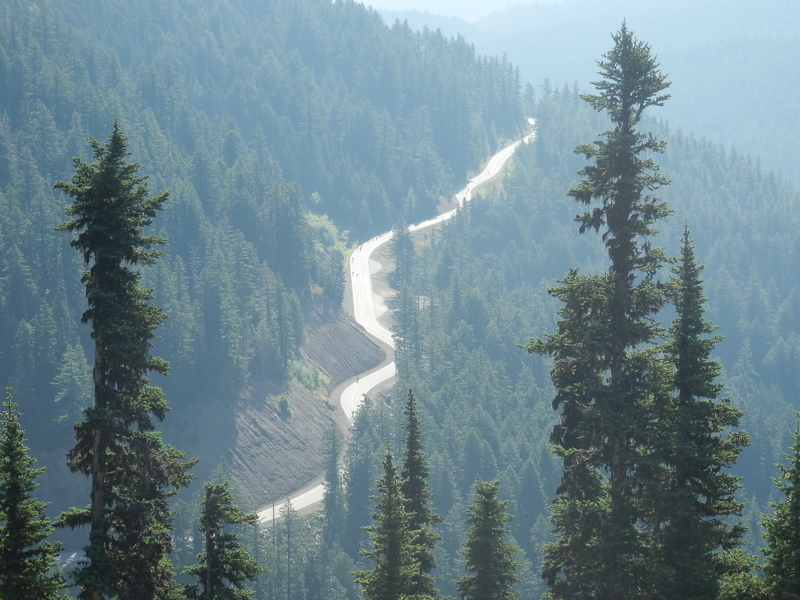 The Switchback Trail descends very steeply down to the road a few miles below where I’d left my car. This sign, therefore, marked the perfect place for me to turn around and return to the visitor center. I returned a little more slowly, even though the shadows were beginning to lengthen. I found myself deep in a meditation about life, about how wonderful it all is, how awesome is the fact of simply being alive. Not merely being here but participating in it, making it happen, step by step by intentional step. Sometimes I wonder if this whole “activity streak” has become an obsession. Perhaps it has, but if it has, I’m convinced that it’s an obsession of an entirely positive sort. It’s become a way of marking my days, of keeping a promise to myself that I will do something every day to ensure that I live it. 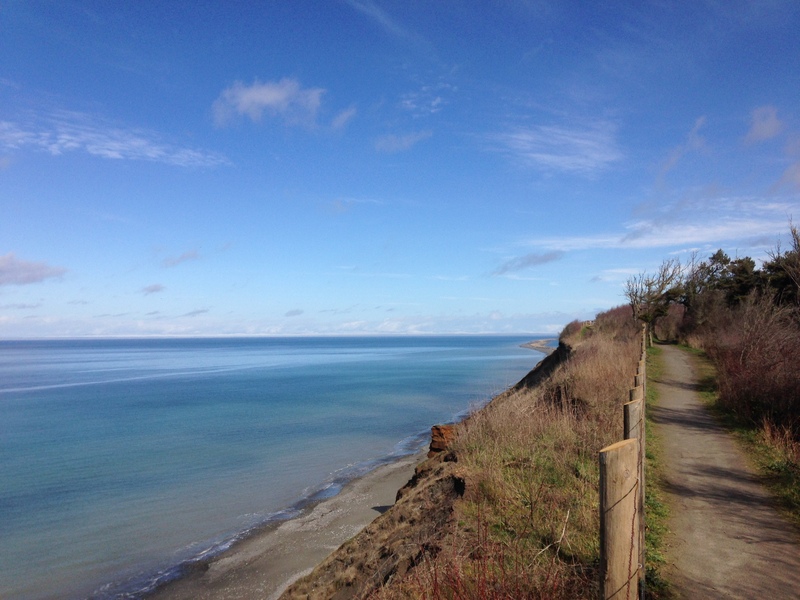 I log my daily miles and how I attained them in a spreadsheet (are you surprised?). It’s become a diary of sorts. I can look back at the end of a day, a week, a month… or soon, a year… and know a little something about how I chose to spend my finite, precious time. 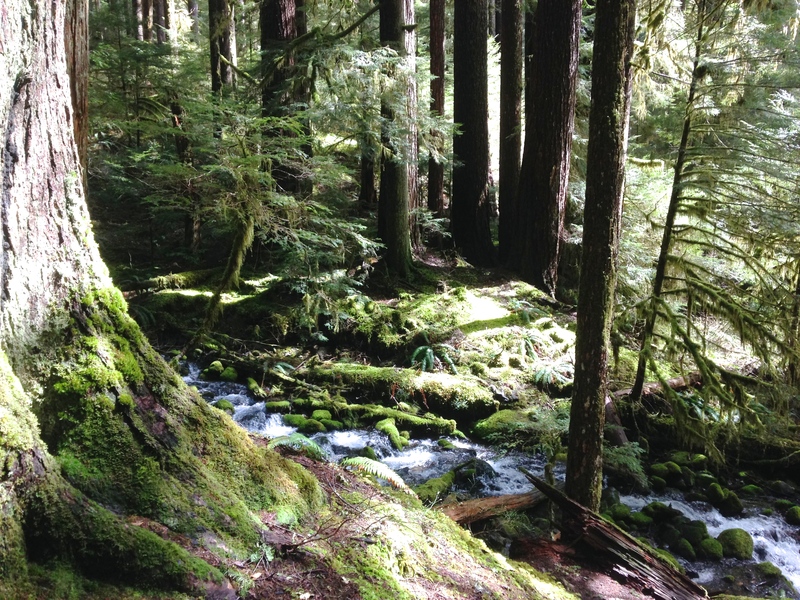 Today I did a 5.3 mile hike in Olympic National Park. 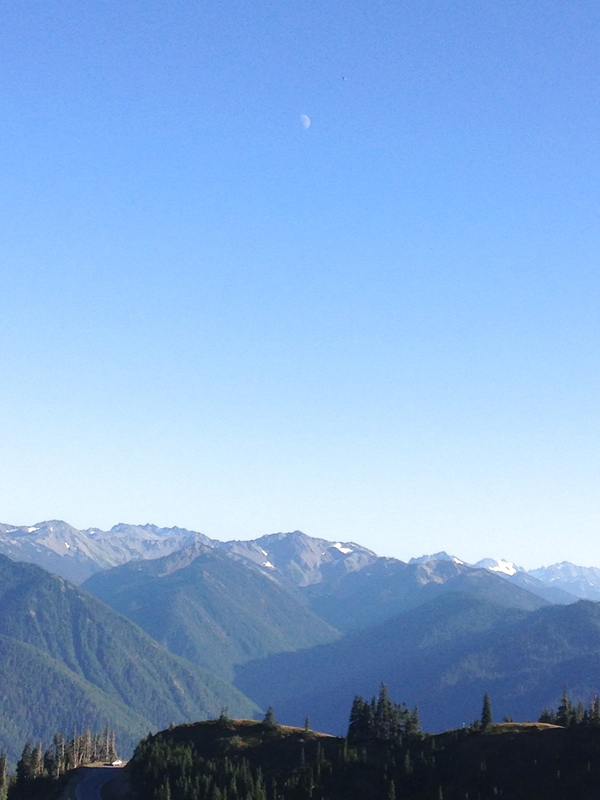 I stopped along the way to notice things like the moon low in the summer sky over Hurricane Ridge. As I was driving down the hill toward home, I lost myself in another way, listening to music in the car. Michael Franti’s “Hey Hey Hey” came up. It’s a simple song, and the lyrics as a whole aren’t that relevant to the thoughts I was having today. But the catchy refrain “I won’t let another moment slip away” resonated deeply. 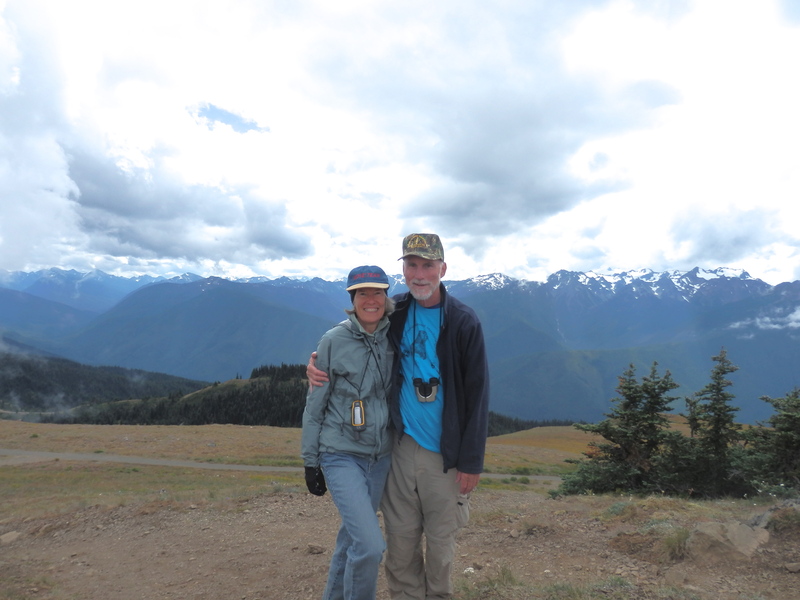 Despite the best efforts of the medical profession and the best care that I could give him, my late husband spent the last days of his life angry and in pain. Perhaps in some part of my heart, in my daily quest for significant movement, I am still running away from my memories of those moments. I prefer to think that I am running toward the opposite of those moments. I want my moments and my miles to add up to something. I want to experience each of them fully — slowly and happily. I don’t want to let another moment slip away. I’m relaxing and having a home brew. And writing. Oh yeah, and after that there is grocery shopping and bill paying and pre-cooking for a potluck. Those moments matter too. I shall be intentional about doing them, however. And then I’ll go out and meet some friends for dinner. Don’t let another moment slip away! 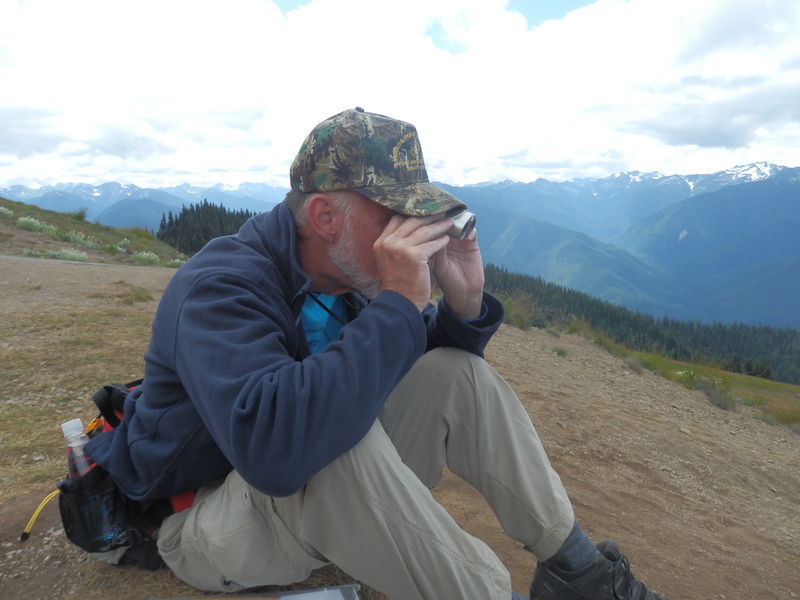 Over this past week we spent three days in our “back yard,” participating as volunteers in Olympic National Park’s marmot monitoring program. 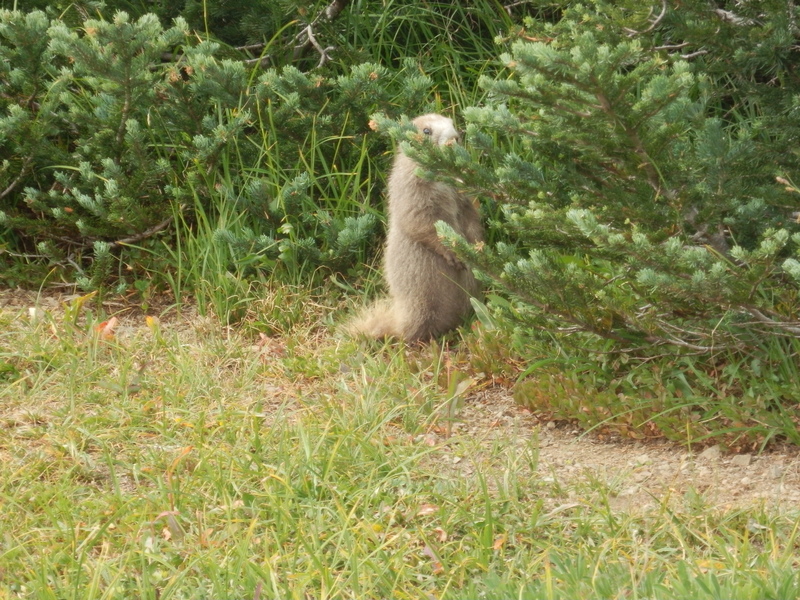 NOTE: All of the marmot photos below were taken with a zoom lens. 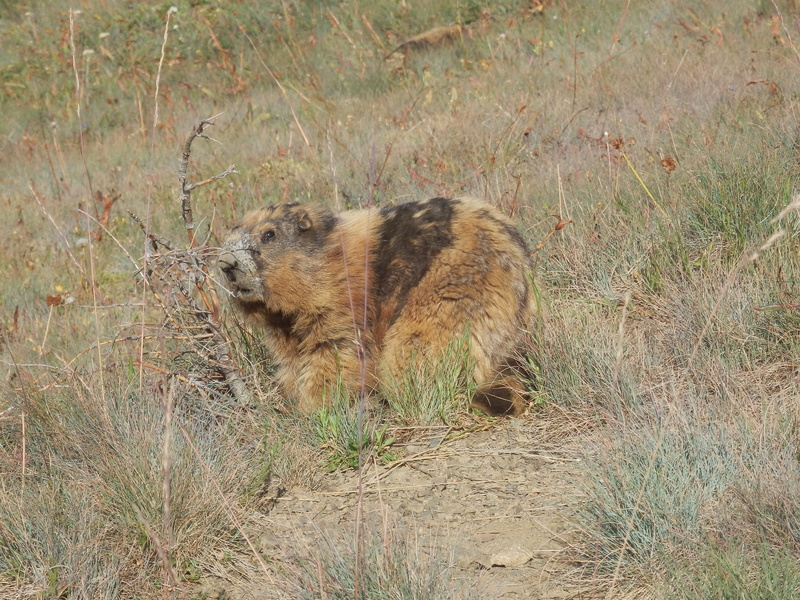 Although marmots are not particularly bothered by the presence of humans, I would never get so close to a wild animal in its natural environment. Wouldn’t you want to spend as much time as possible with these cute little guys? 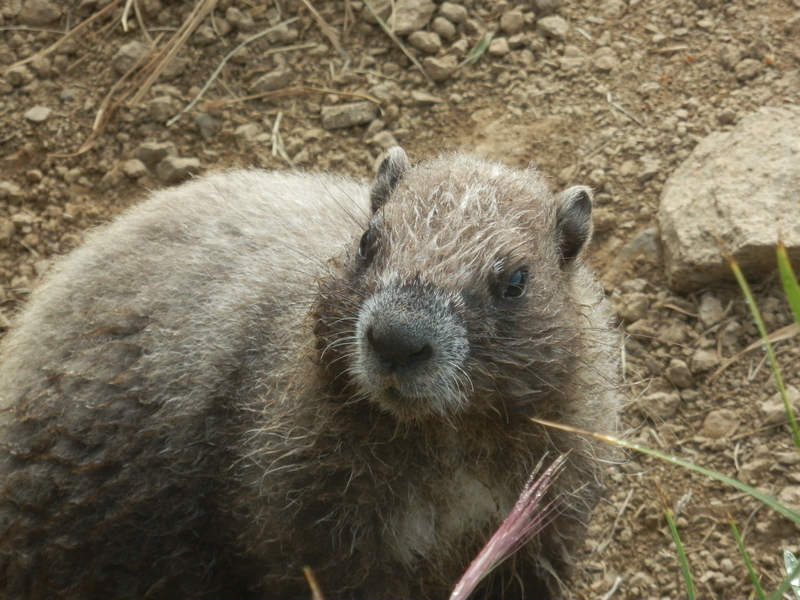 The Olympic Marmot is endemic to the Olympic Peninsula; 90% of the Olympic Marmot population lives within the boundaries of the Park. 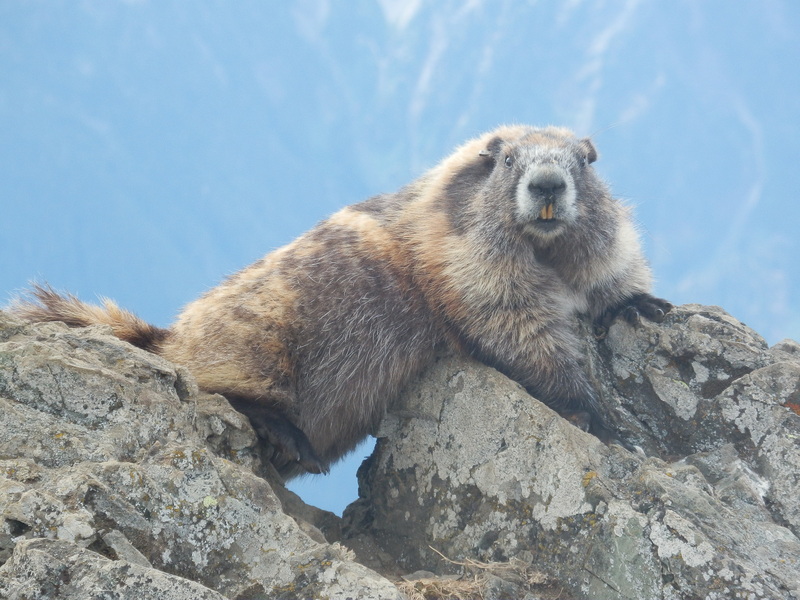 Historically, a stable population of 2,000 or more Olympic Marmots existed, but about ten years ago anecdotal reports began to indicate that the population was in rapid decline. By the year 2006 the estimated population was only 1,000. 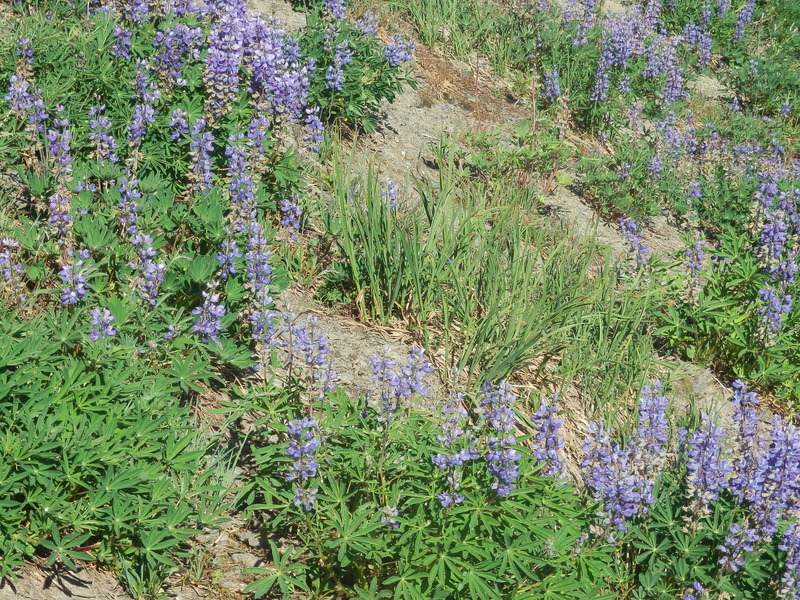 The probable cause of this decline is predation by coyotes, which are not native to the area. 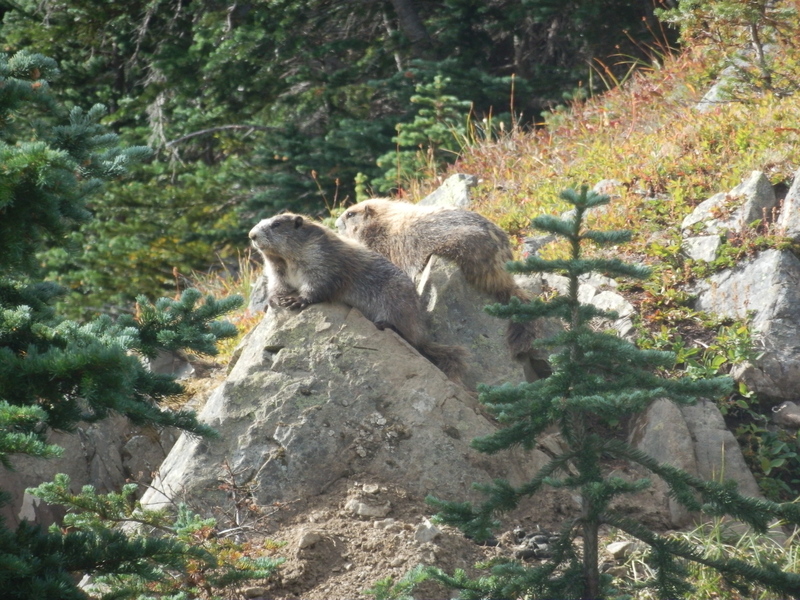 Although the population is currently rebounding, the marmot’s lifecycle (slow reproductive rate, long hibernation time, limited mobility within its range) and other factors including climate change cause concern for the long-term viability of this unique species. 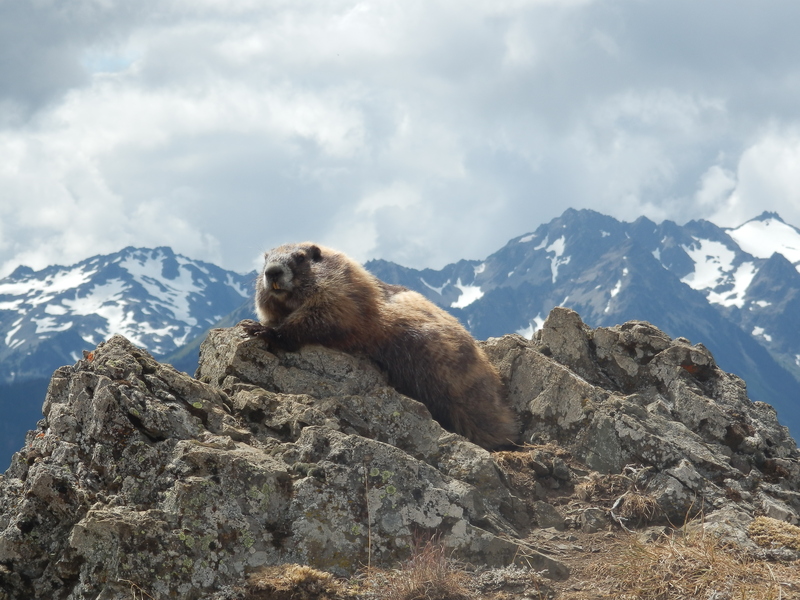 In 2010, Park biologists began a citizen marmot monitoring volunteer program. 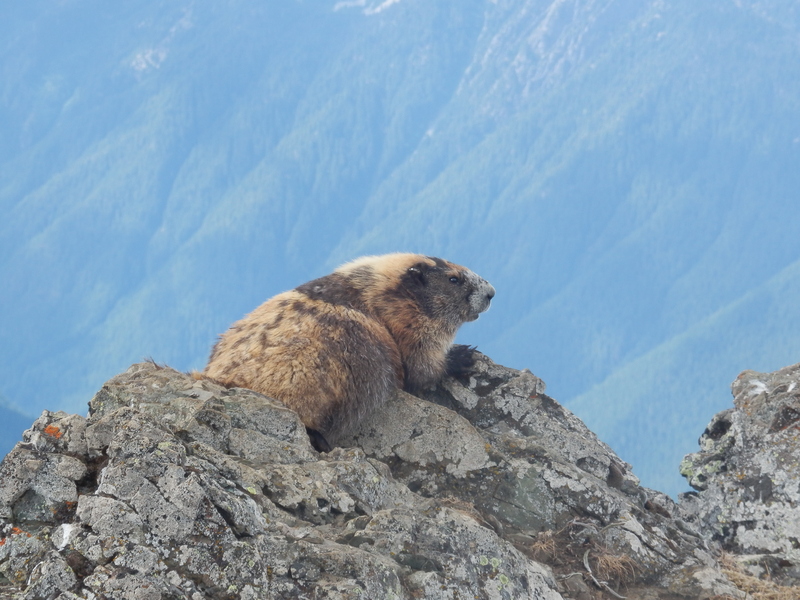 The idea is to survey areas within the Park that are known or likely sites of marmot habitat. The program is now in its fourth year. CFL and I volunteered to participate this year and were thrilled to be selected! We began with a morning of classroom training followed by an afternoon in the field. This video taken at a prior year’s training will give you an idea of what is involved. You’re done — move on to the next unit. Move on to the next unit. As first-year volunteers with (in my case) no overnight backpacking experience, we requested and were assigned to a front-country area. 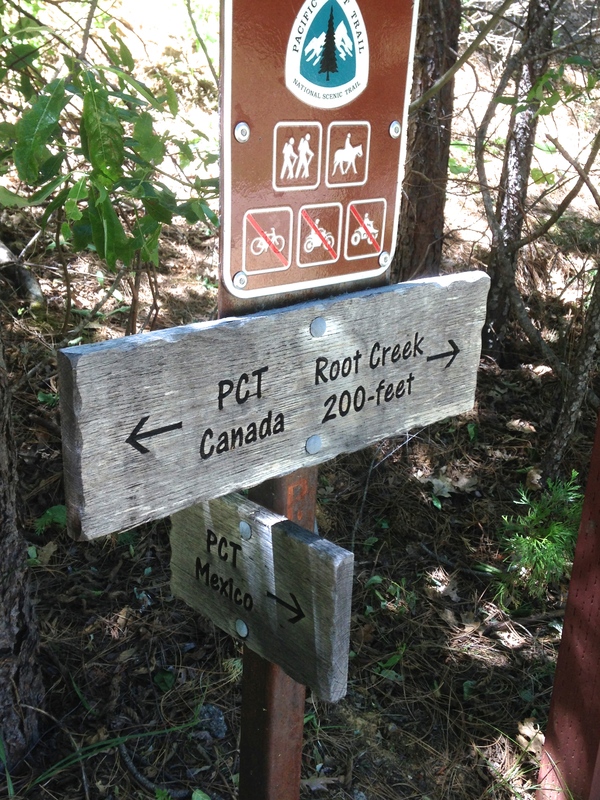 The most remote of our units was only about three miles from the trailhead. Hiking out to each unit was the easy part! Once there, we left the trail and scrambled across meadows. 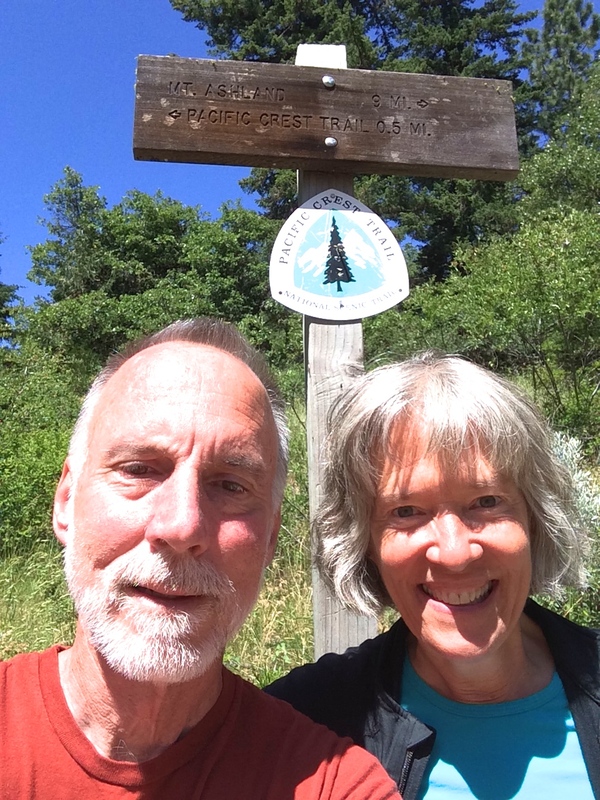 These sub-alpine meadows are extremely fragile, and we would normally never go off-trail — but this time we were doing it in our official volunteer T shirts. We felt like kids getting away with something! 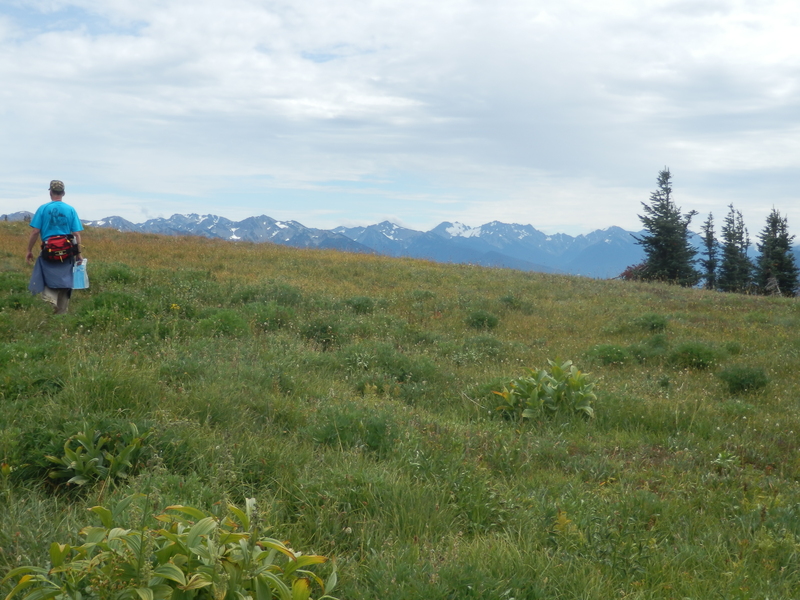 In many places the meadows are steeply sloped, and getting around the unit can be difficult. The next photo shows a typical occupied burrow. 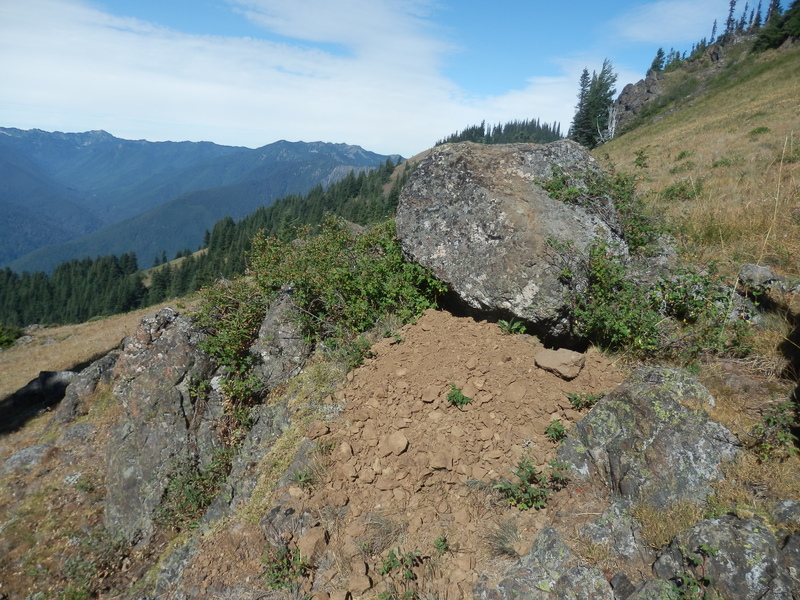 Note the freshly-dug dirt as well as the dirt on top of the rock (left behind by sun-bathing marmots). To get here, we had to hike for some distance sideways across the slope. It’s a good workout for toes, ankles, knees, and hips! Accesses to and/or within couple of our units were so steep that we didn’t attempt to hike into them — but we didn’t need to, because we could survey them from above with binoculars. 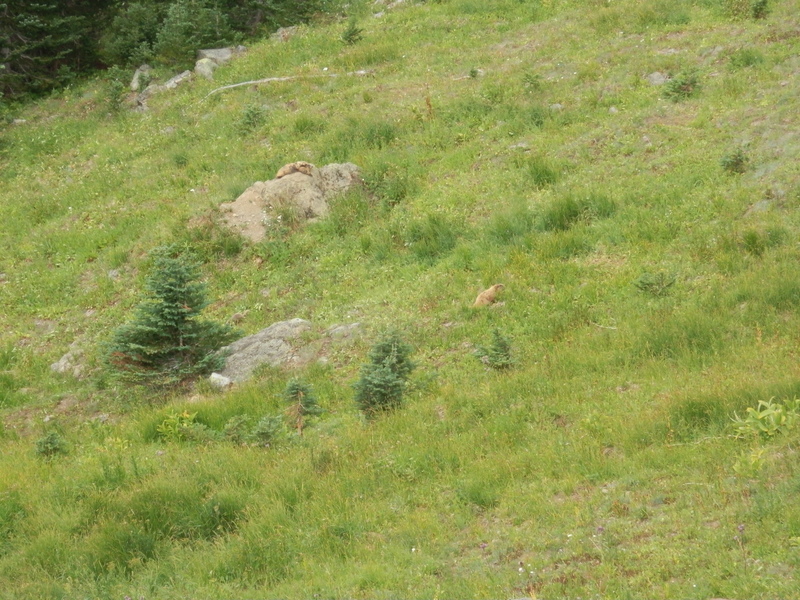 There are (at least) three marmots in this photo. Can you spot them all? The pups are grayish in color. Adults have two-layer coats, brown to yellow-brown with a darker undercoat. Many of them are in the process of molting right now. This big guy is sporting an ear tag. 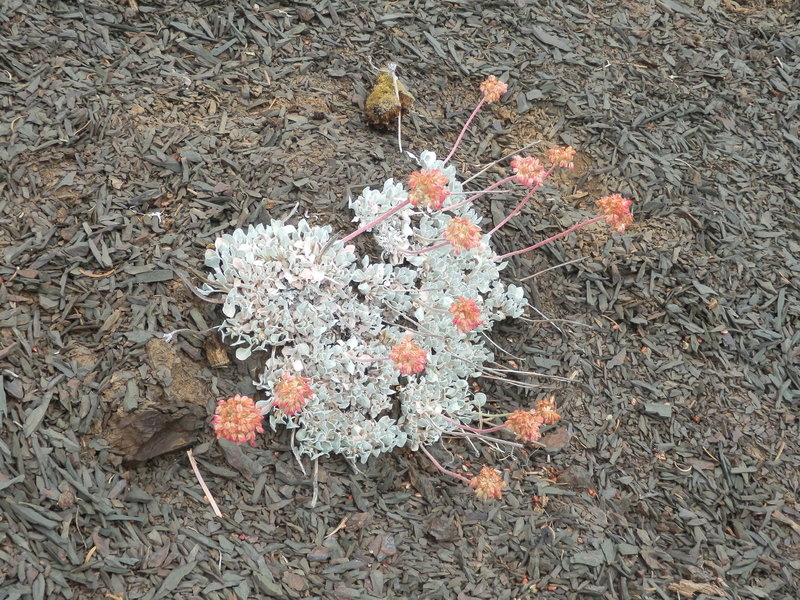 We’re hoping that the Park biologist can identify him or her from our photos and tell us more about him. He or she was very patient with us while I took numerous photos in this stunning setting. However, he finally expressed his displeasure by showing us his incisors, so we moved on and let him enjoy the rest of his day in peace. 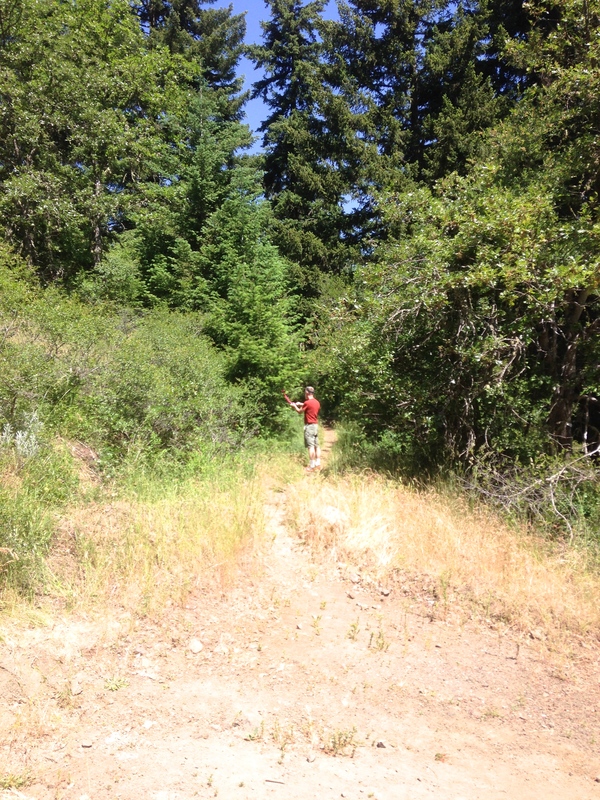 To our surprise, we didn’t see a single black bear or mountain goat during our three days of off-trail excursions. 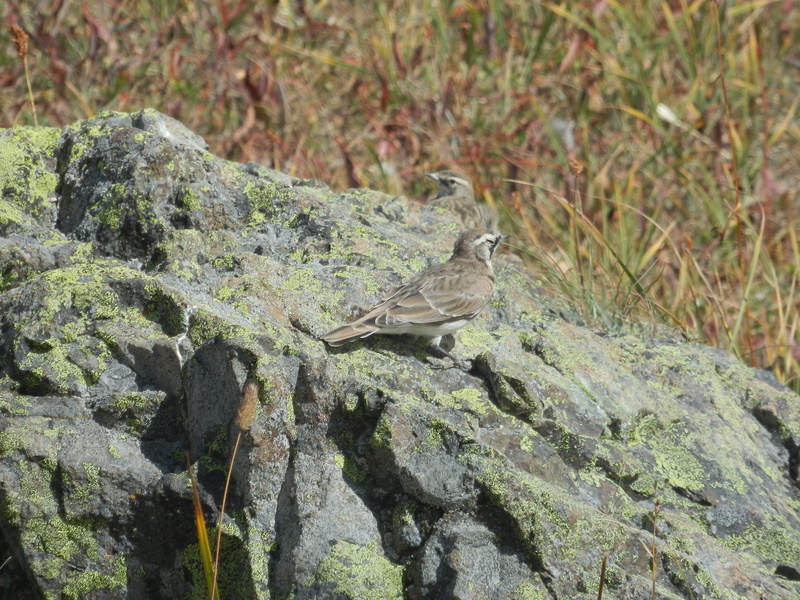 We did see a golden eagle (a first for me), lots of deer, and some other interesting birds. 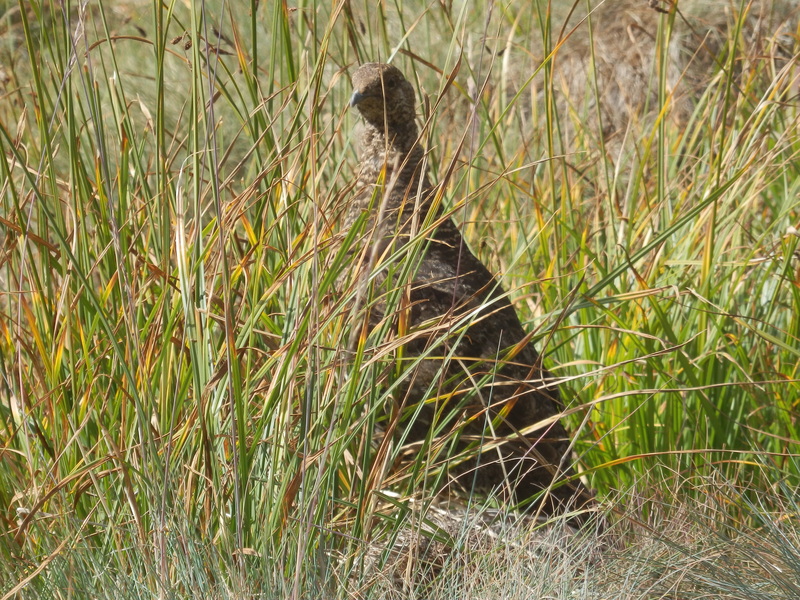 I believe this is a female sooty grouse (formerly known as a blue grouse). She had at least three chicks with her, but they were impossible to find through the camera viewfinder in the tall grass. 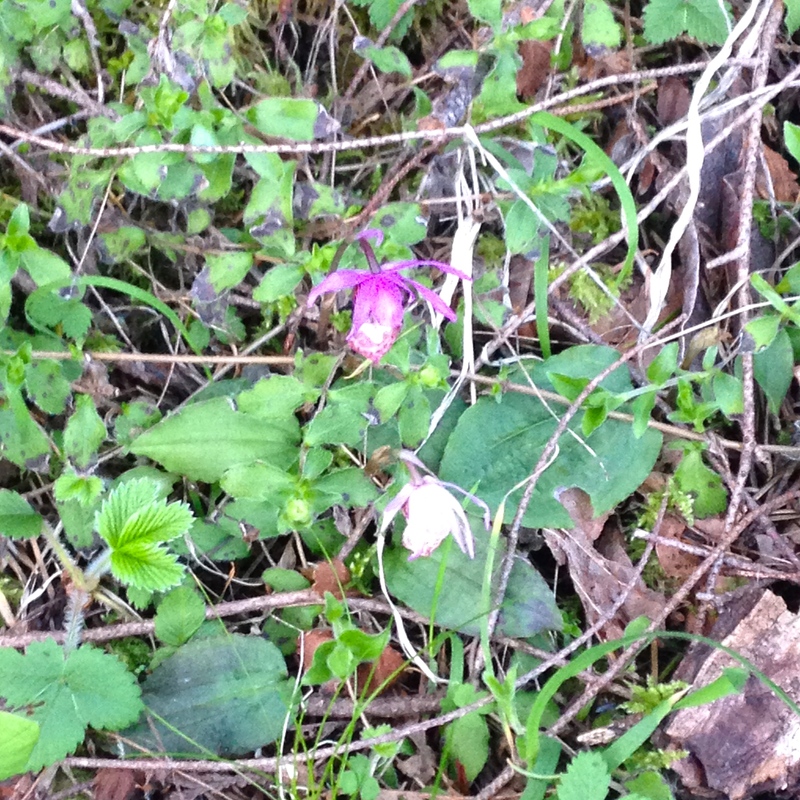 Sadly, the wildflower season is pretty much over, but we did see some beautiful specimens. 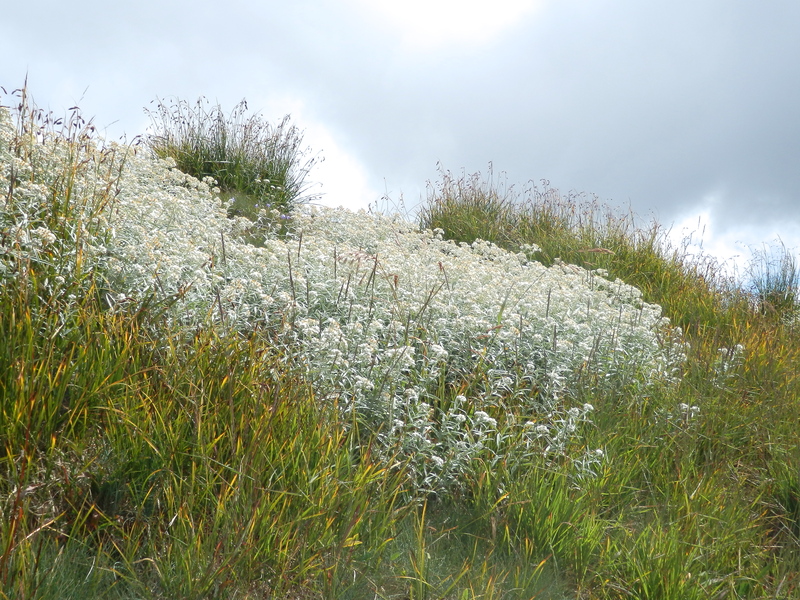 This is pearly everlasting. 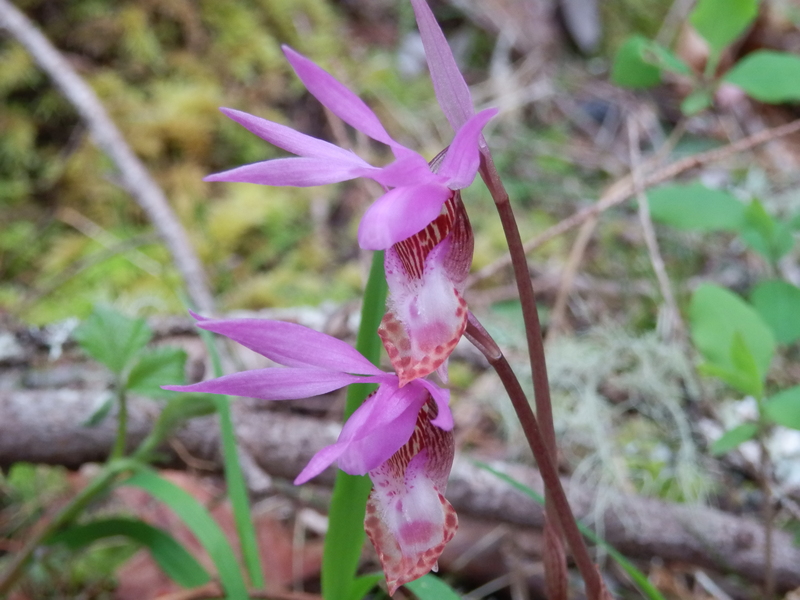 I have no idea what this gorgeous flower is, but we saw it only in a few places where there was loose shale. All told, we hiked about 15 miles over the three days, at least a third of which was off-trail. 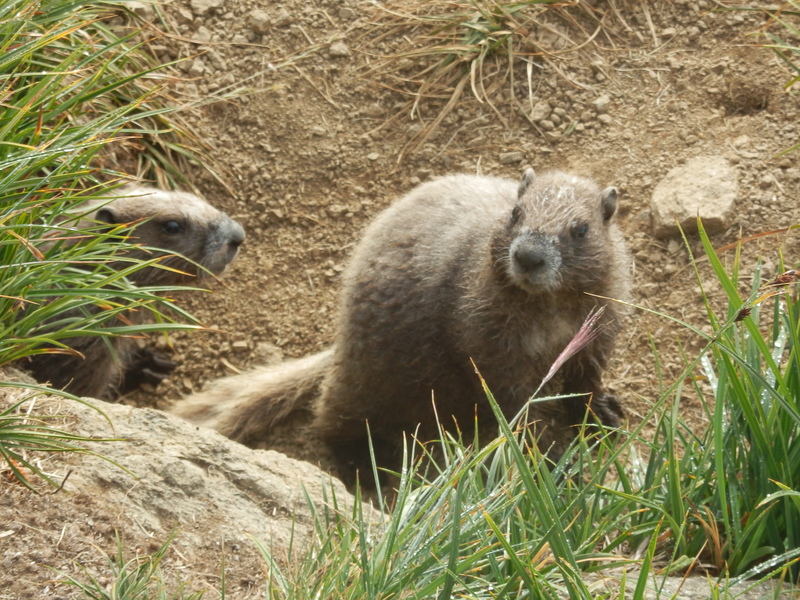 We saw marmots and/or marmot burrows in 12 of our 14 units. We were very happy citizen scientists! 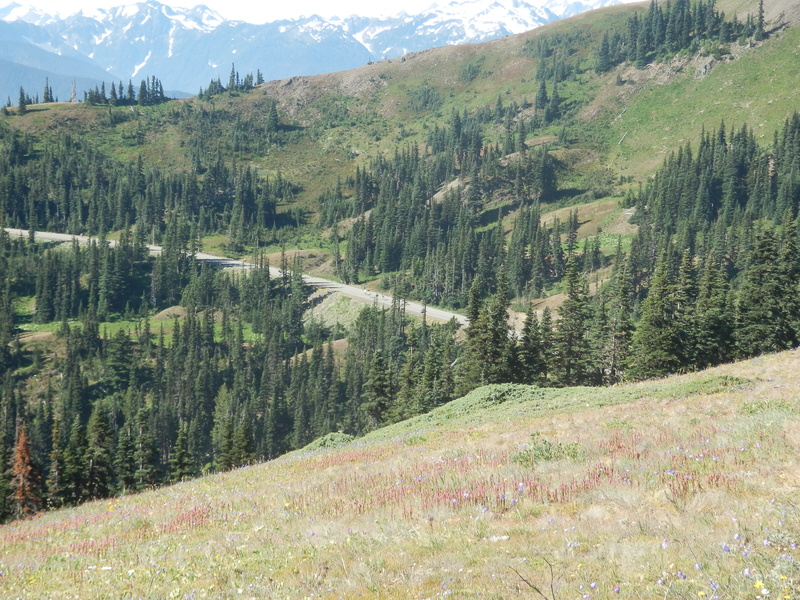 We will certainly volunteer to do it again next year — maybe even venture into one of the back country areas. All in the name of research! The other day some people took a fun little bike ride in our part of the world. There were 522 registered riders in the fourth annual Ride the Hurricane. 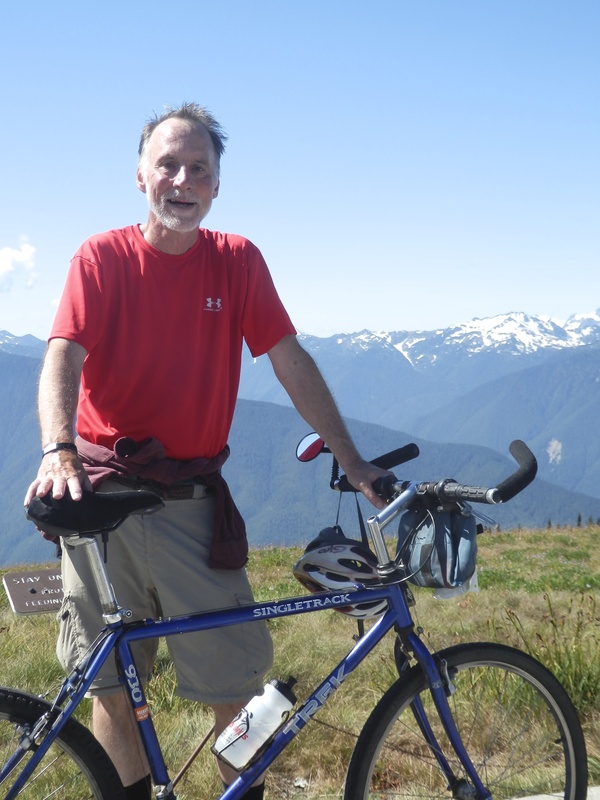 This event — a fun ride rather than a race — is organized by our local Chamber of Commerce with the involvement of the staff at Olympic National Park. 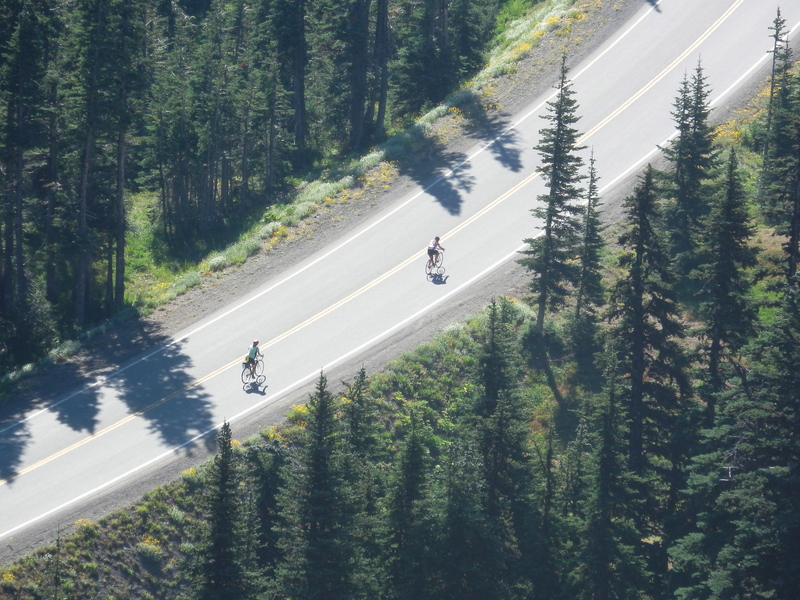 For six hours on a Sunday morning, the road from downtown Port Angeles into the Park and up to Hurricane Ridge is closed to automobiles, transformed into a superhighway for bicycles. This was CFL’s third time in this event. He usually rides up to the Ridge solo at least one other time during the summer, but this was his first trip up this year. 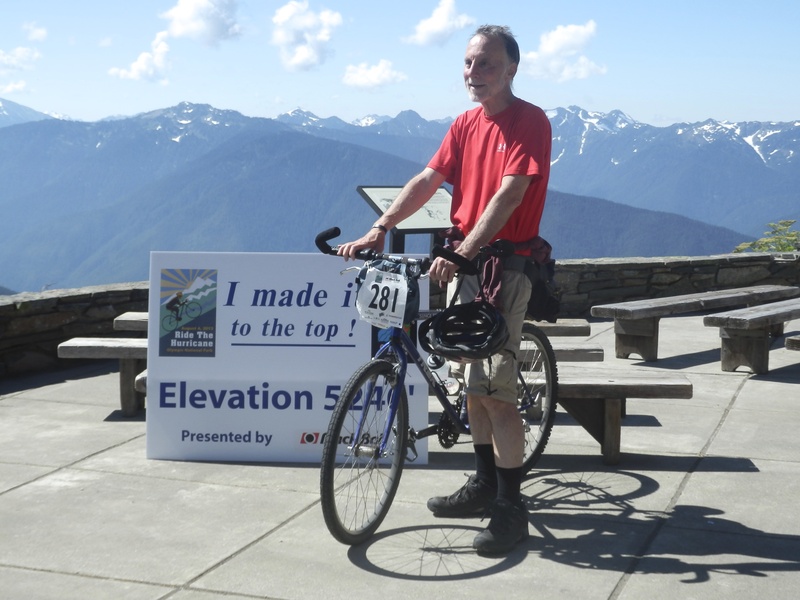 The ride is 36 miles roundtrip, with an elevation gain of nearly 5,000 feet on the way up and the equivalent (very rapid) elevation loss on the way down. New for this year was a spectator shuttle, which turned the event from a personal cycling challenge into an adventure that loved ones could share. I watched CFL start out on his ride, then I got on the shuttle. 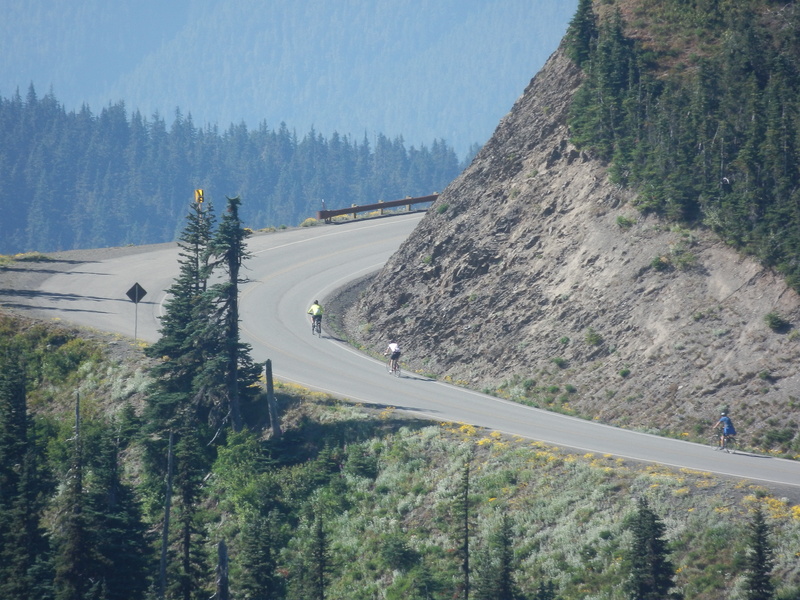 We drove very carefully up the Hurricane Ridge road, mostly in the left lane, passing hundreds of panting cyclists. That is a steep road! I waved at CFL as we passed him at about mile 6. At the top, most people positioned themselves at the finish line so they could cheer for each arriving cyclist. 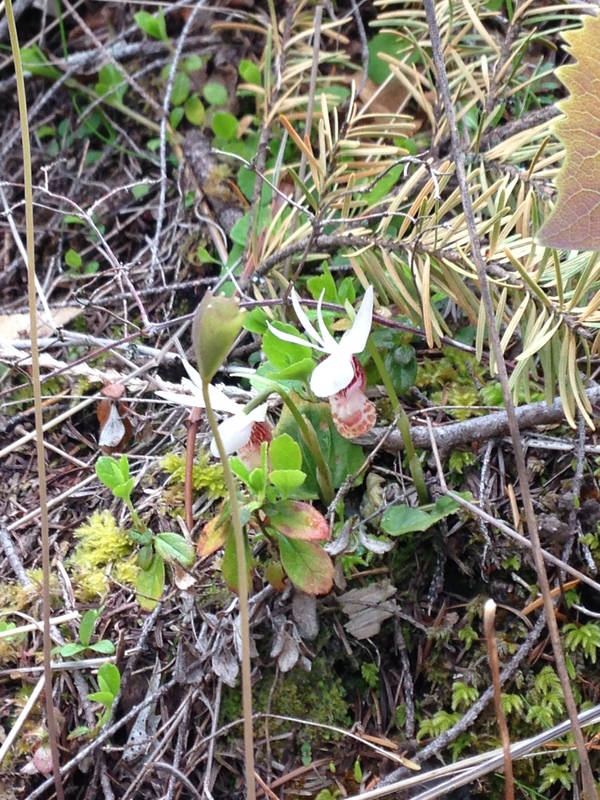 However, I knew that CFL would take about four hours to reach the top — which gave me nearly two hours for hiking! 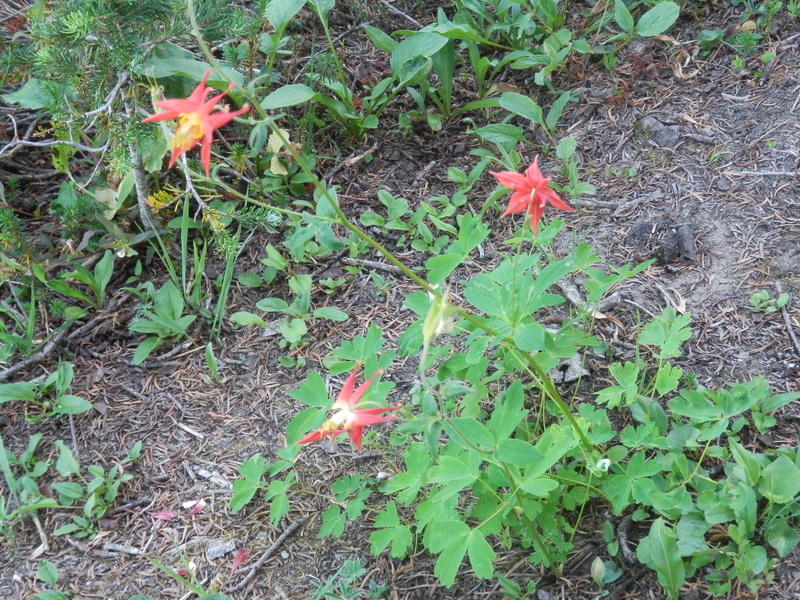 CFL and I have been so busy with many other things that we haven’t had many opportunities for high country hiking. 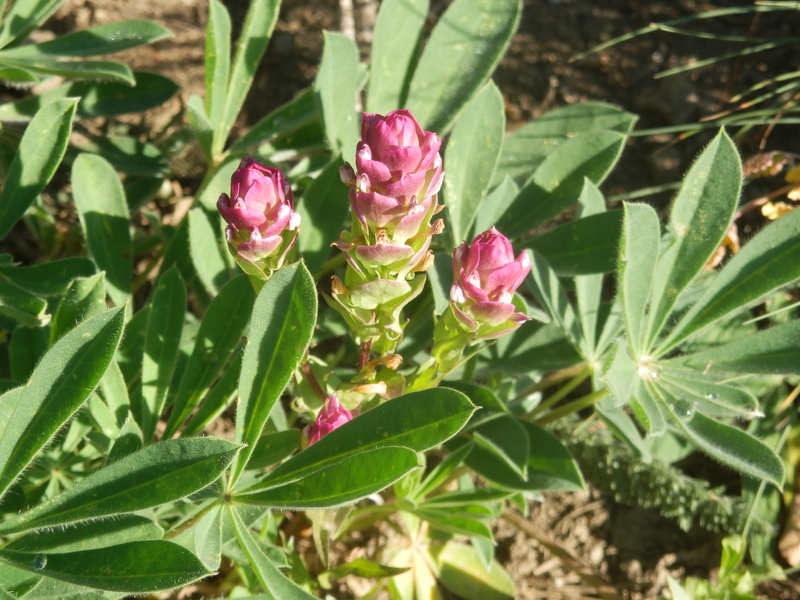 Some of the best wildflowers are already gone. 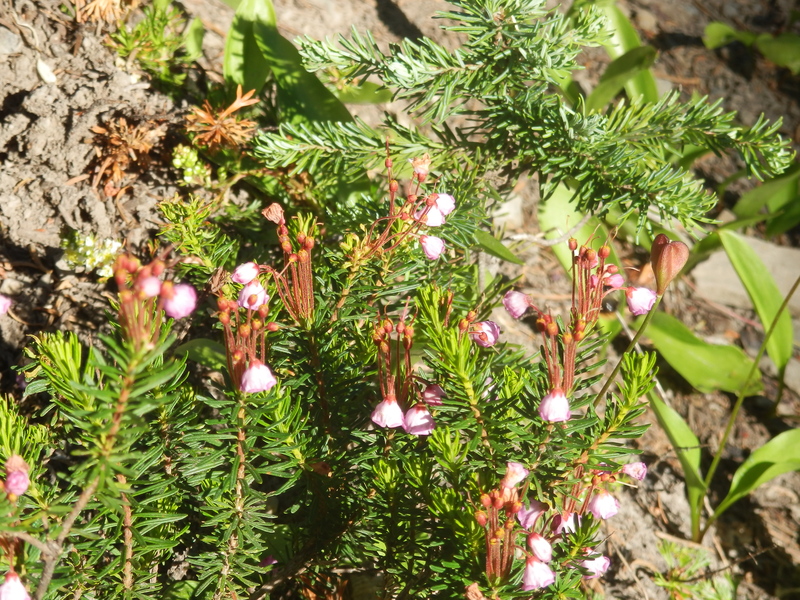 However, I was hopeful as I set out along the Klahhane Ridge Trail. It didn’t take me long to realize that I had given myself an extraordinary opportunity. Because the road up to the Ridge was closed that morning, there was almost no one on the mountain. 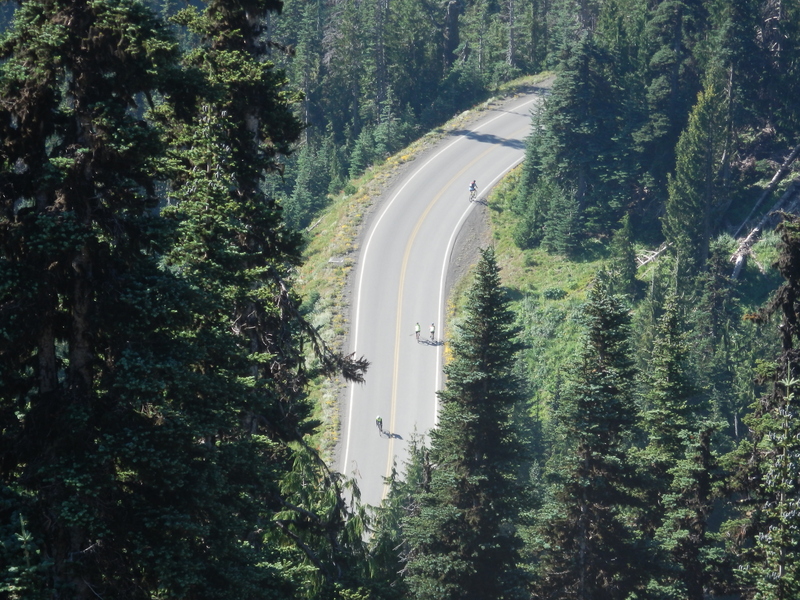 The trail runs along the ridge high above the road, which gave me occasional birds-eye glimpses of cyclists far below. Now and then I’d hear a shout from the road, but most of the time all I heard was birds and bugs. I was on that trail all by myself. This struck me as slightly weird and a bit disconcerting at first. 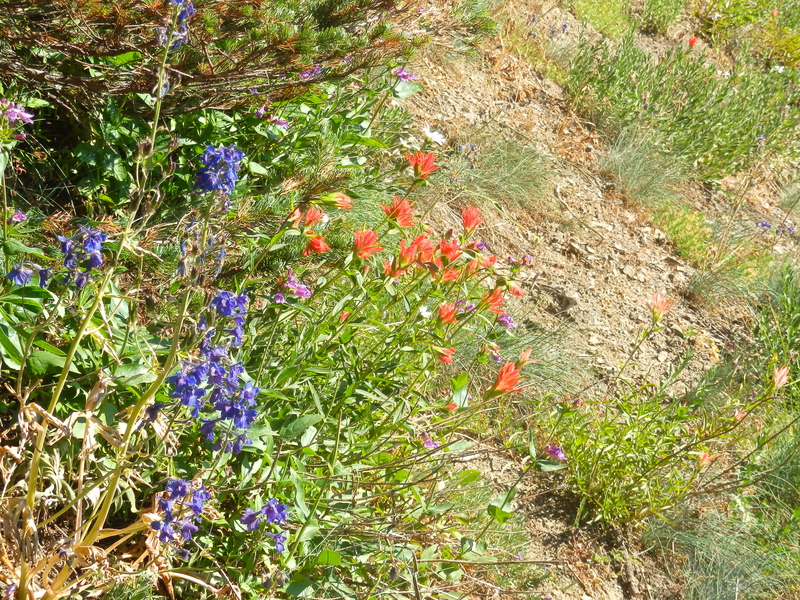 But as I continued to walk I lost myself in the wildflowers and mountain views, and I relaxed. I hiked out for just over two miles, then somewhat reluctantly started back. 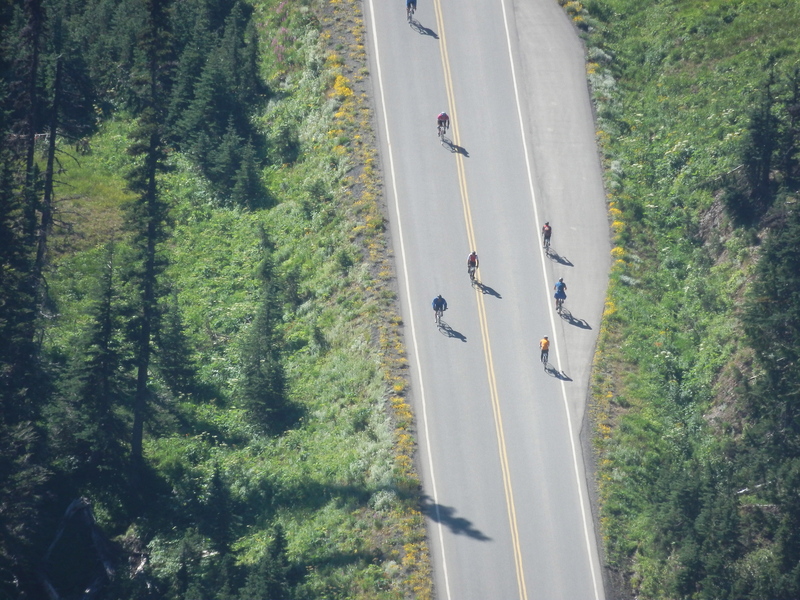 The return trip provided the best angles for viewing the cyclists on the road. These photos were taken with a zoom lens. 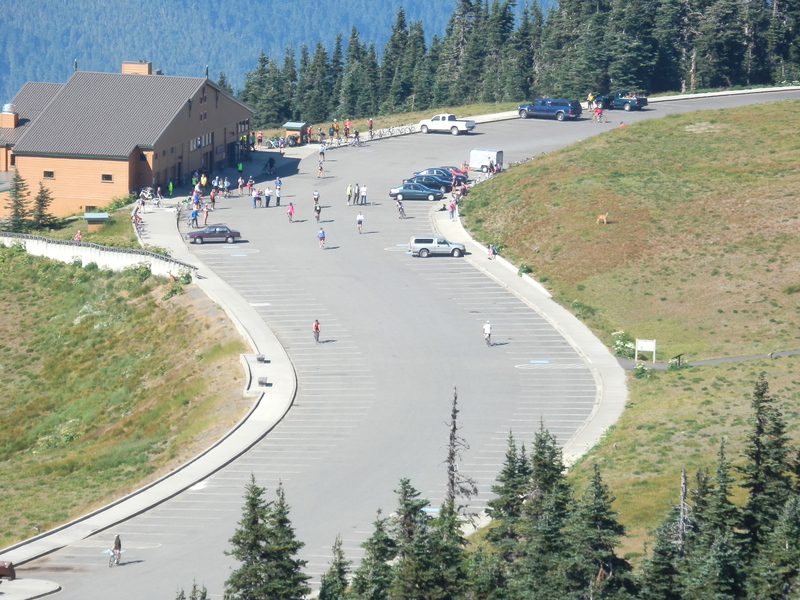 During the last half mile of my hike I was looking down at the parking lot where the cyclists were arriving. I hurried back from that point to make sure I wouldn’t miss CFL’s arrival! 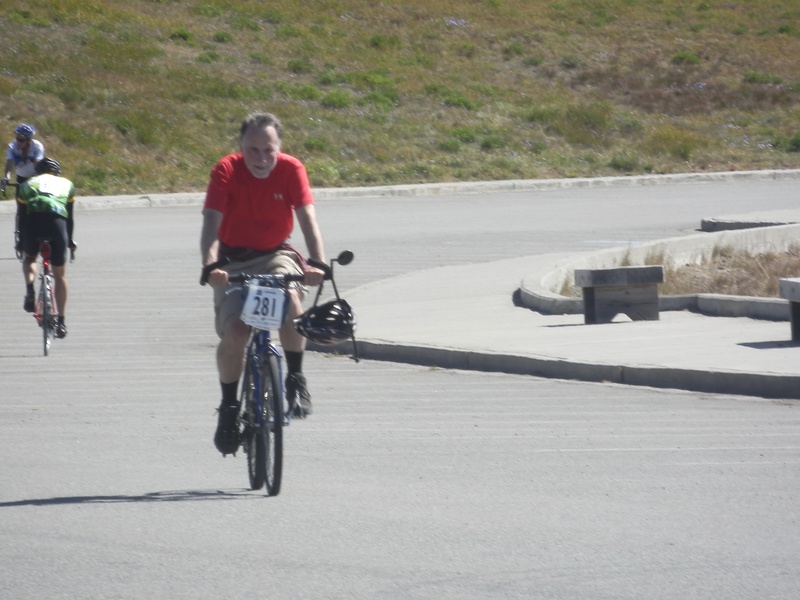 Sure enough, I’d only been at the finish line for about ten minutes when he pedaled around the final curve. He was a little tired (understandably!) but recovered quickly and was his usual smiling self moments later for his official portrait. It was simply a wonderful day for both of us! An awesome bike ride, a perfect hike, and many hours soaking up the midsummer sun. Then we relaxed and had a couple of home brews! Today is the 190th day of 2013 — just past the halfway point of the year. Although I haven’t yet moved far from my computer this morning, as of last night I’d run, walked, hiked, and biked a total of 972 miles. I’ll hit 1,000 miles in less than a week from now. Neither CFL nor I have missed a single day of human-powered forward motion. I have dutifully logged my every mile in one of my famous spreadsheets. CFL is a bit more casual about his record keeping so I can’t report his actual mileage, but his daily activity streak is intact. We’ve walked through airports and around shopping malls to keep the streak intact. On road trips, we’ve driven out of our way to find interesting small towns where we can sample the local craft brew and then walk around downtown for an hour or so before getting back in the car. 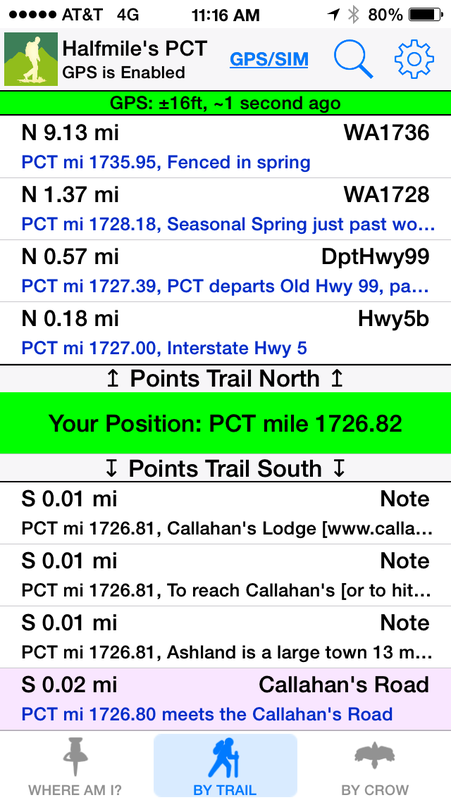 So far I have run 464 miles, walked 401 miles, hiked 91 miles and ridden my bike 16 miles. I really need to ramp up the biking miles! Next month we are going to Portland to ride the Bridge Pedal — a 33-mile ride over ten of Portland’s Willamette River bridges. I’m still not comfortable riding my bike on a public road, much less in close company with a few thousand other riders. I’m more nervous about running into another cyclist and causing both of us to fall, than I am about riding on a public road. As I understand it, the bridges themselves will be closed to auto traffic during the ride, but I’m not sure about the roads between the bridges. It’s time to seriously increase the hiking miles as well. 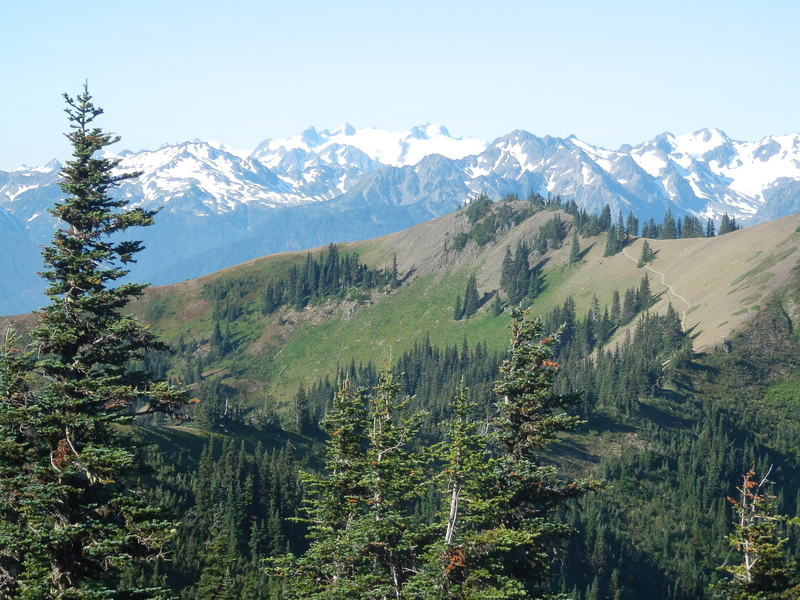 The mountain snow is almost gone, and I want this to be the year when I finally do an overnight backpacking trip. And oh yes, the running miles are going to ramp up considerably as well, as I move into the serious weeks of training for my first full marathon. Within a week or two I plan to ease myself through the first big psychological barrier — running more than 13.1 miles (the half marathon distance) on one of my Sunday morning long slow runs. I’ve discovered that if you spend enough hours outdoors, it’s possible to get a tan even in western Washington. I’ve discovered that the home brew tastes even better when you’ve been out there earning it step by step! Our friends have grown accustomed to seeing us together walking around downtown. These days I never drive anywhere within a radius of about three miles from home, unless I’m planning on bringing back a large load of groceries. We’ll be ready for the next gasoline panic — we’ll simply keep walking. When we started this thing at the beginning of the year, I honestly didn’t think we would continue it for long. 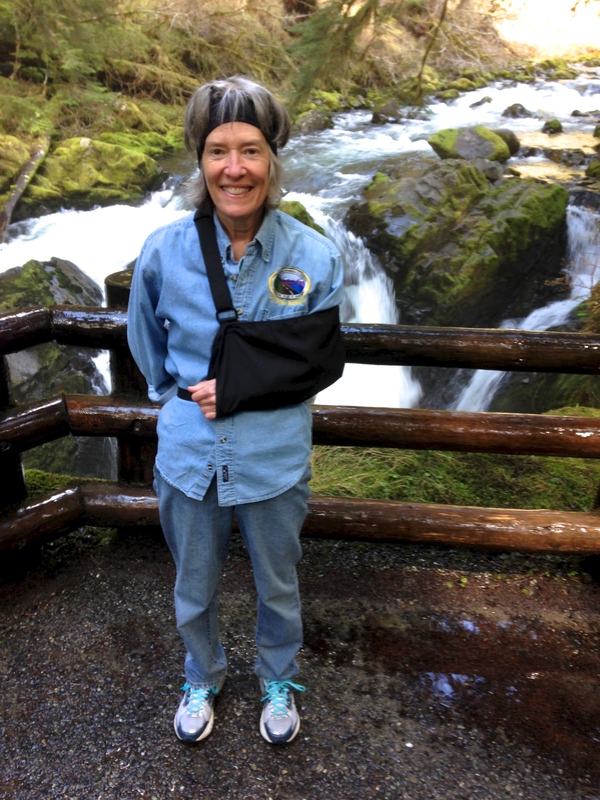 Now — barring serious injury or illness — I can’t imagine not being active every day. About a month ago I was moving some large plant pots around in the back yard and somehow managed to drop a concrete block on my foot. It was seriously bruised but not broken, so I walked… slowly… the same afternoon. Tomorrow I’ll hit the trail again for a 7 mile run. Then I think a high-altitude hike would go well, a bit later in the week. And another bike ride of course! The possibilities are endless. Slow and happy — one step at a time!